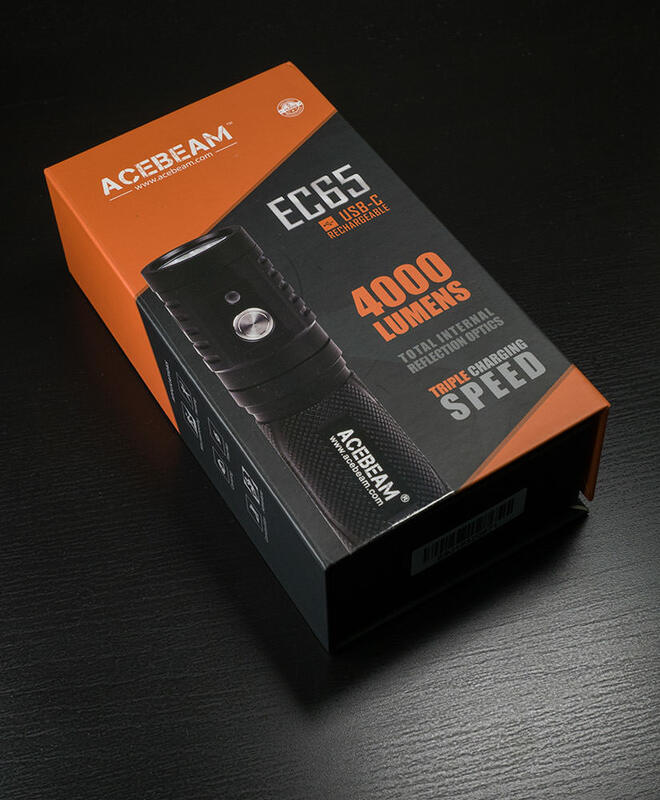 The Acebeam EC65 is an EDC sized 60 watt hotrod quad with an advertised maximum output of 4000 lumens and fast USB-C charging for the included 21700 5100mAh battery. It’s available in two versions. 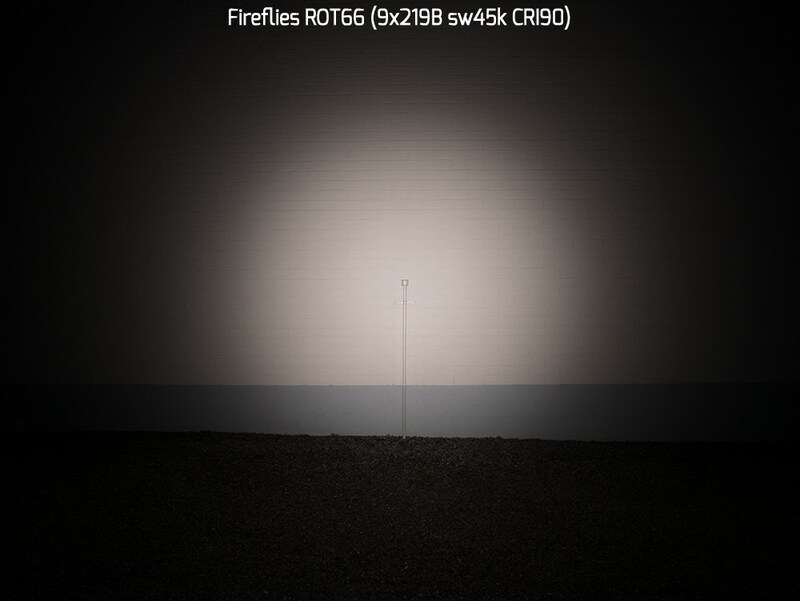 One uses four cool white Cree XHP35 HI emitters and the other a high CRI Nichia 219Cs. The XHP35 HI version was out first and is also the one tested here. 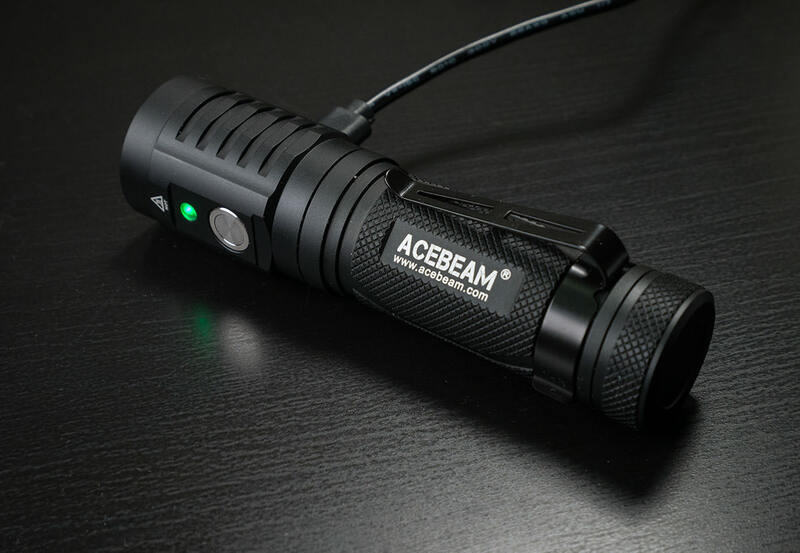 The Acebeam EC65 is a well built bright hotrod with a pretty beam. Excellent choice for the cool white lovers. Don’t bother with 18650s if you want maximum output for longer than a couple of seconds. 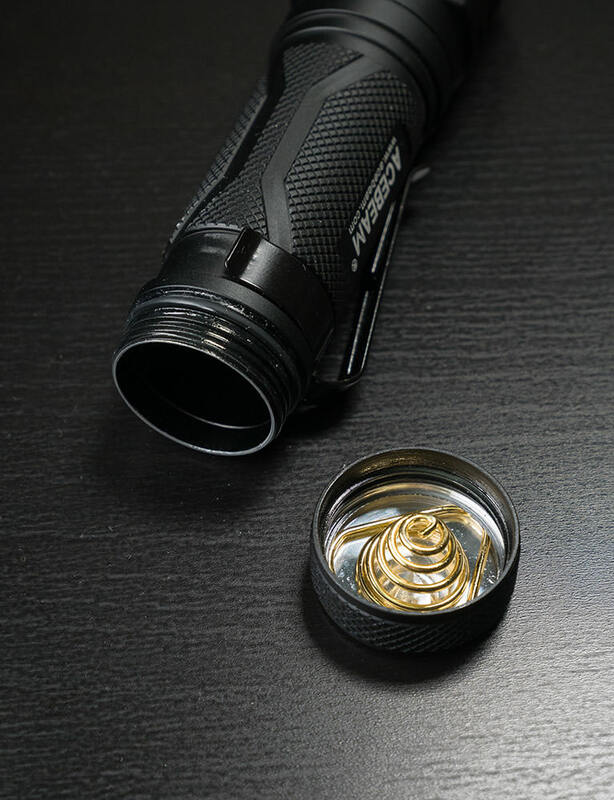 The actual turbo output is 3000 lumens after the first burst with a fully charged battery. 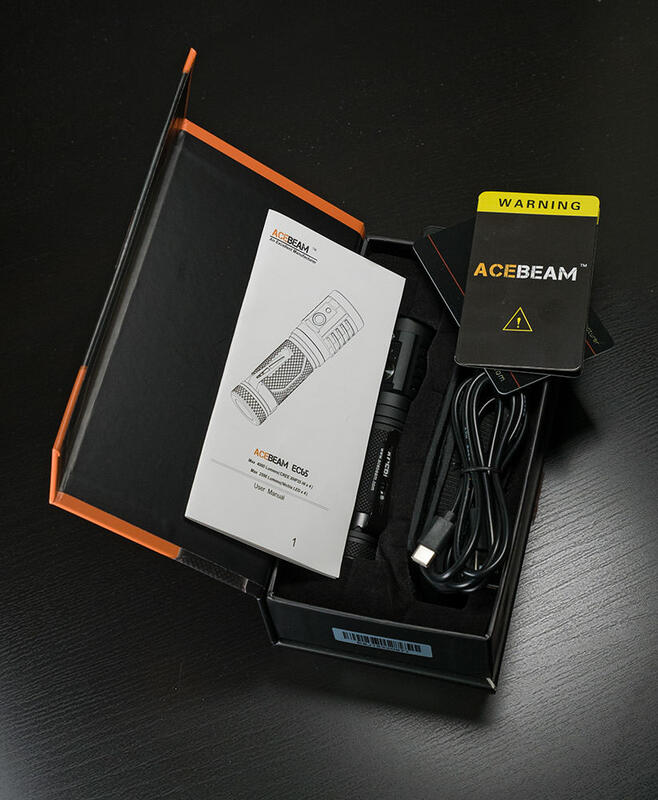 Acebeam’s new line of retail boxes are attractive with a magnetically closed lid. 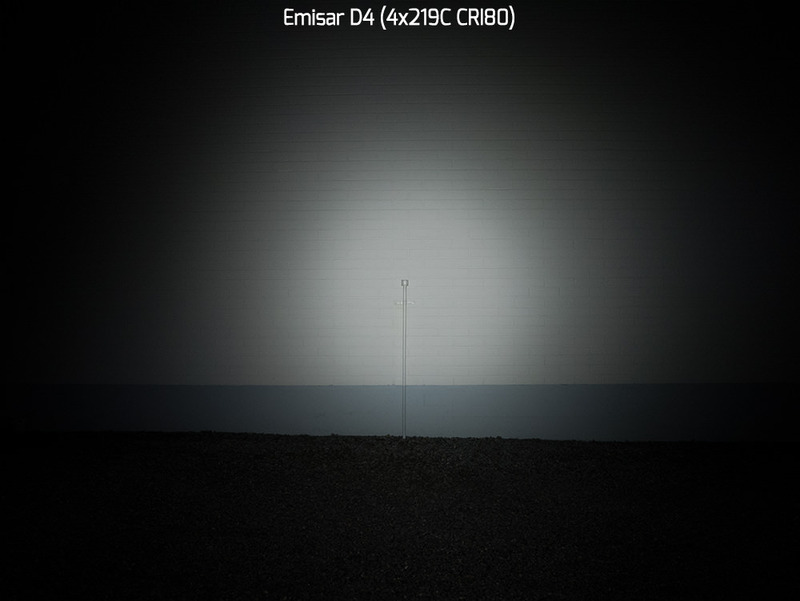 The four XHP35 HI emitters are behind a clear Carclo 10622 optic. It’s the throwiest option in the quad optic lineup, which sometimes manifests as a beam with tint inconsistency problems. Not so with the domeless HI emitters though. The side switch is recessed and not easily accidentally acitavated. There’s an electronic lockout, but as it’s activated and deactivated with 3 second long press, I prefer the physical option of opening the tailcap just a bit. USB-C charging port is behind a rubber cover. On high and turbo, hot air build up inside the light and at some point escapes through the cover making a farty sound. Green light indicates full battery. Red means charging. That’s the only job for the indicator LED. The tailcap spring has a tendency to rattle a bit when there’s no battery inside. 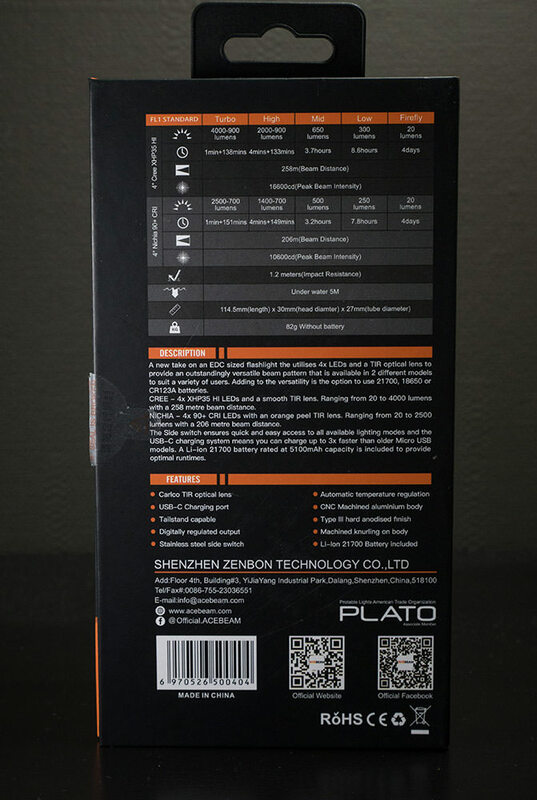 The backside of the 22.4 mm driver. It’s held in place with two small screws. The body is glued to the head, but can be removed with some force. 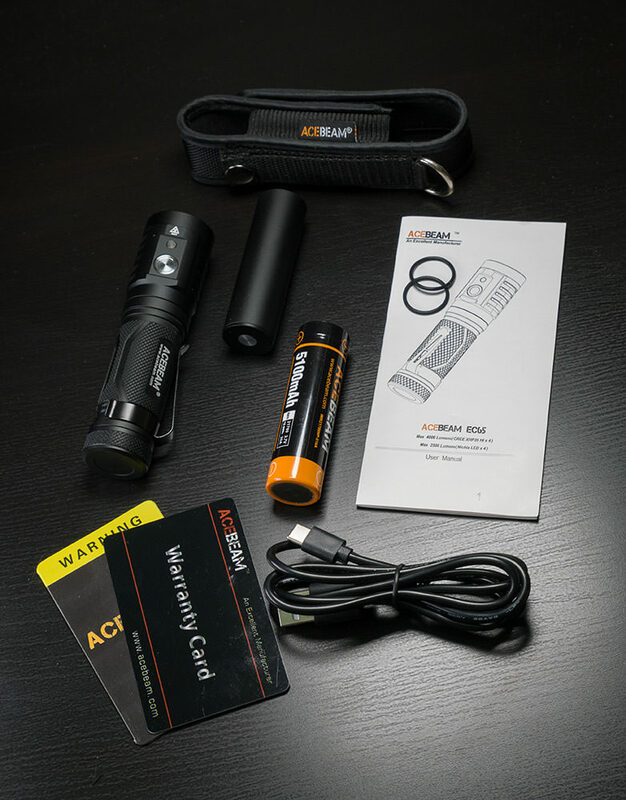 Acebeam bundles a protected 21700 battery with the light. Model number IMR21700NP-510A. Side by side with an 18650. 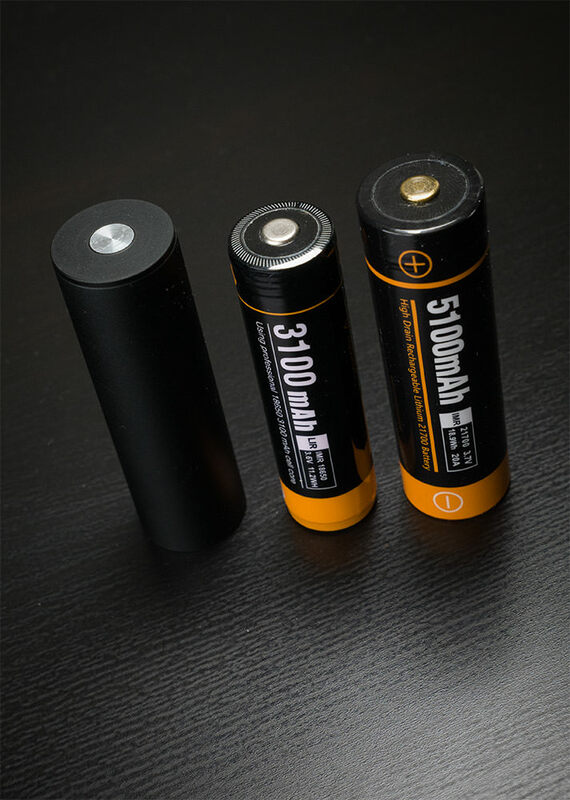 The included adapter makes it possible to use 18650s in the 21700 sized battery tube. The bezel comes off easily and reveals the AR coated 26.8 mm lens, o-ring and a ring that holds the optics in place. 23.5 mm MCPCB is screwed on the shelf. A 24.7 mm MCPCB can be fitted. The emitters are rotated so that the beam doesn’t appear square. Size comparison to some 18650 triples/quads. The EC65 isn’t that much bigger than most of them but does feel more substantial due to the larger body and added weight. 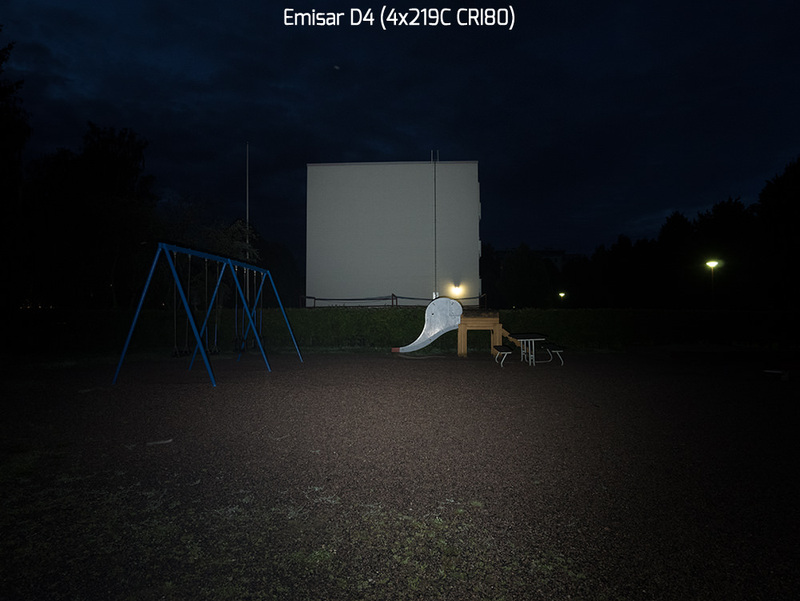 Acebeam EC65, Wuben TO46R, Astrolux S41, YLP T95 CRI, Emisar D4. The light is operated via an electronic side switch. There’s a USB charging indicator LED next to it. Low battery or lockout mode is not indicated on the LED. The UI is simple and intuitive. 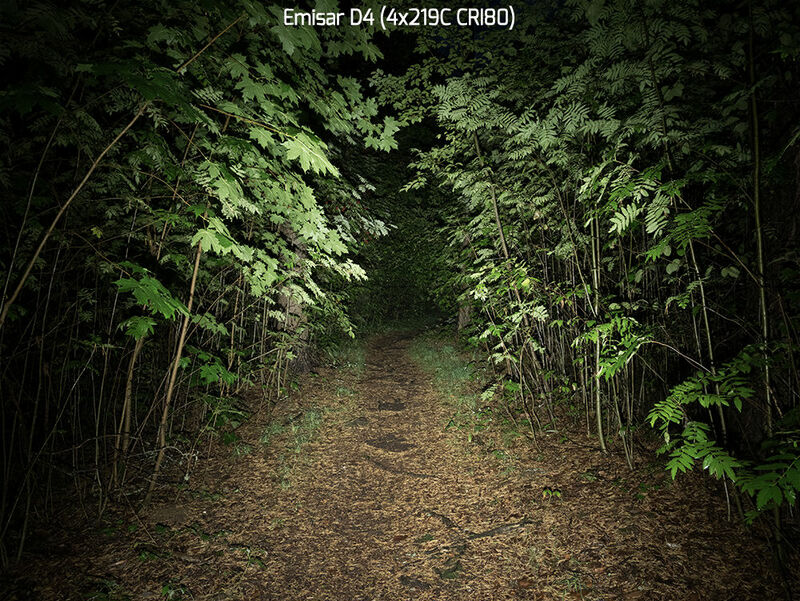 There’s shortcuts to the lowest and highest modes and memory. Perfect in my opinion. Only thing I would probably change is the always return to low from turbo and strobe with long press. Returning to the previously used mode would fit the memory theme. I would also like to have the charging indicator or the main led flash if you’re trying to turn the light on when it has been locked out electronically. It may be confusing as to why the light doesn’t work if someone has locked it out. The integrated charging uses USB-C connector. It draws about 2.2 amps from the USB power supply and fills the included battery in about three hours. The indicator LED on the light is red until the battery is full after which it turns green. The included 5000 mAh 21700 battery has a protection circuit. The protection circuit is on the positive end. There’s no original wrapper under the Acebeam wrapper and I don’t know its origin. It reads C4 B1 #1-3 C2 on the can. Discharge curve at 2 amps. 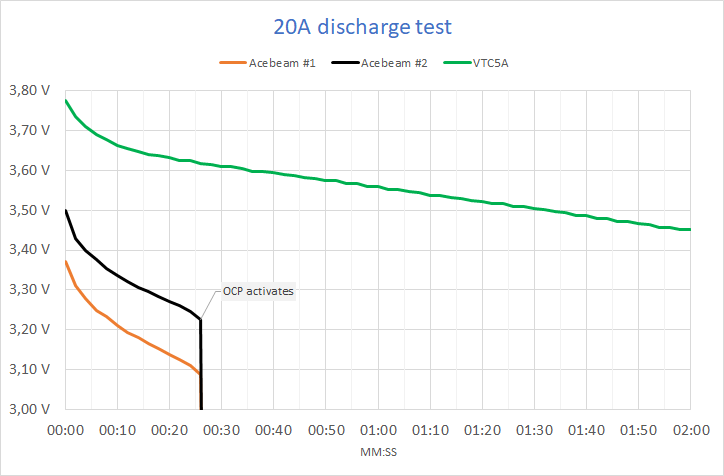 Discharge curve at 20 amps. Sony VTC5A 18650 for comparison. 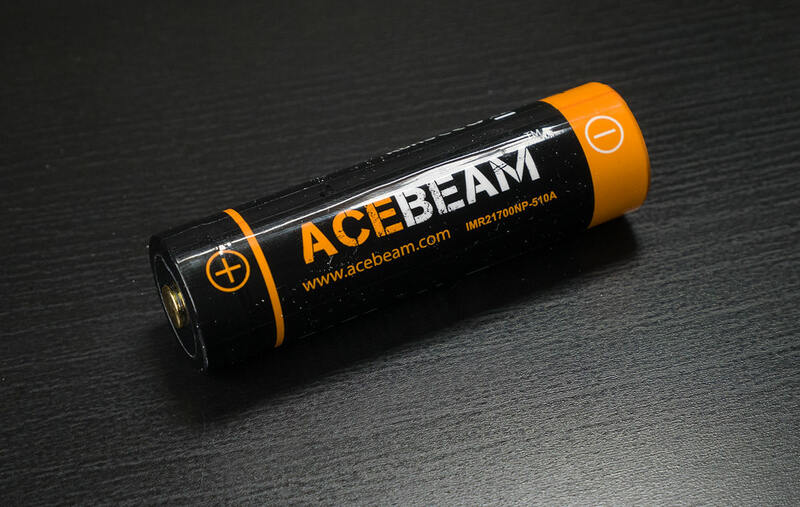 The Acebeam battery is rated for 20A continuous but can’t do it. The cool white beam produced by the four XHP35 HIs and the clear Carclo 10622 optic is smooth and floody with a bit of a hotspot. 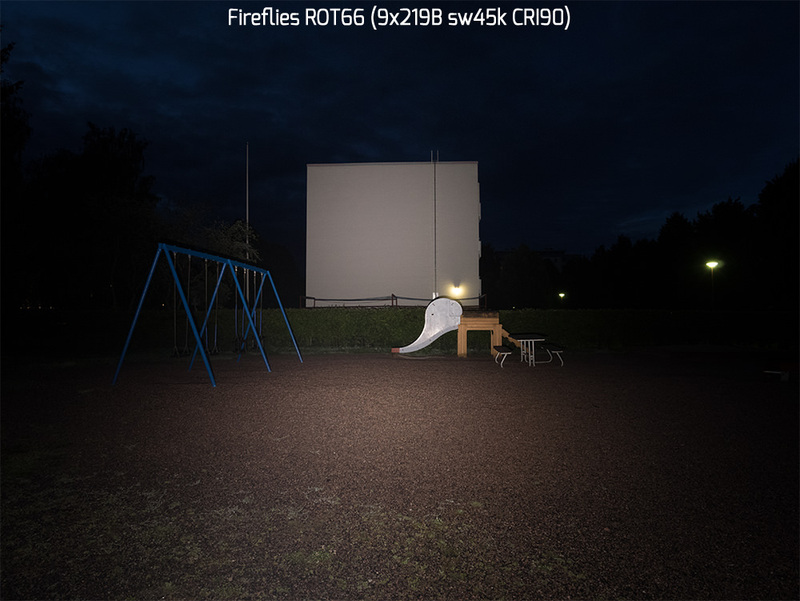 There’s no ringy artifacts and very little shift in color temperature or tint within the beam. There’s only a sligh greenish and warmish tint in the center of the hotspot, which isn’t at all visible on surfaces other than white. 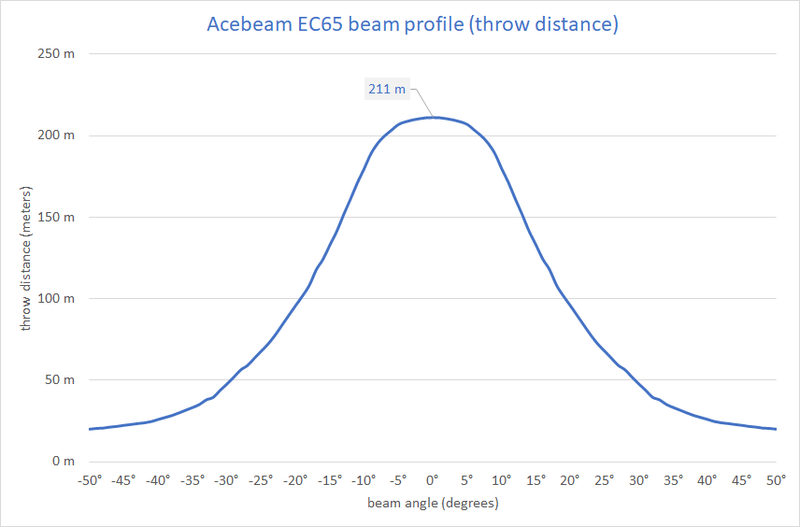 Overall I rate the beam quality good. 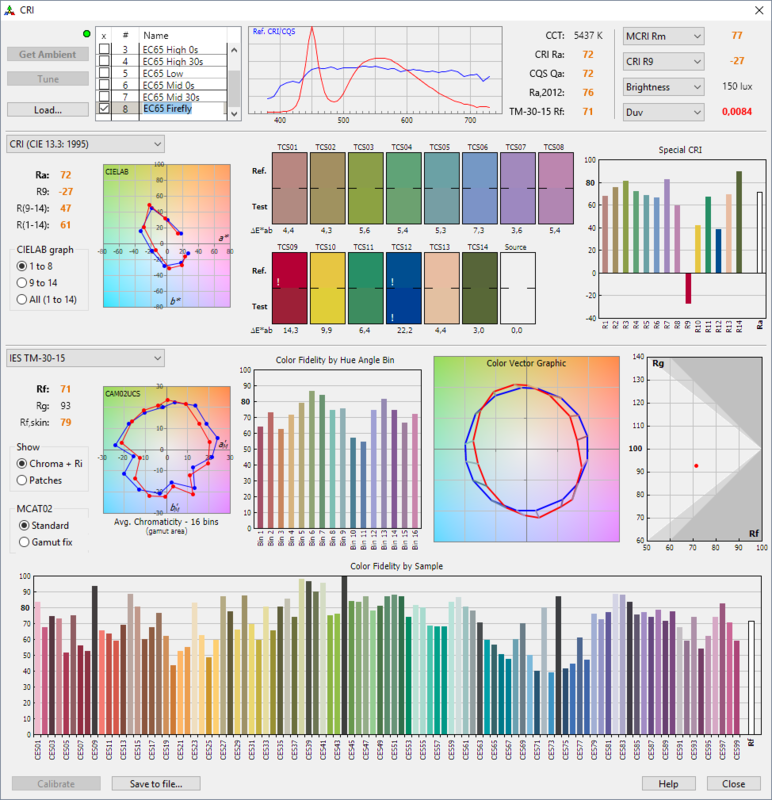 For spectral information and CRI calculations I use an X-rite i1Pro spectrophotometer with HCFR, Babelcolor CT&A and ArgyllCMS spotread for the graphs and data. For runtime tests I use spotread with a custom script and an i1Display Pro because it doesn’t require calibration every 30 minutes like the i1Pro. If you have an hour to spare, I recommend watching this presentation on IES TM-30-15 which also shines light into color rendering in general. As can be expected for a small hotrod, the maximum output doesn’t last very long. 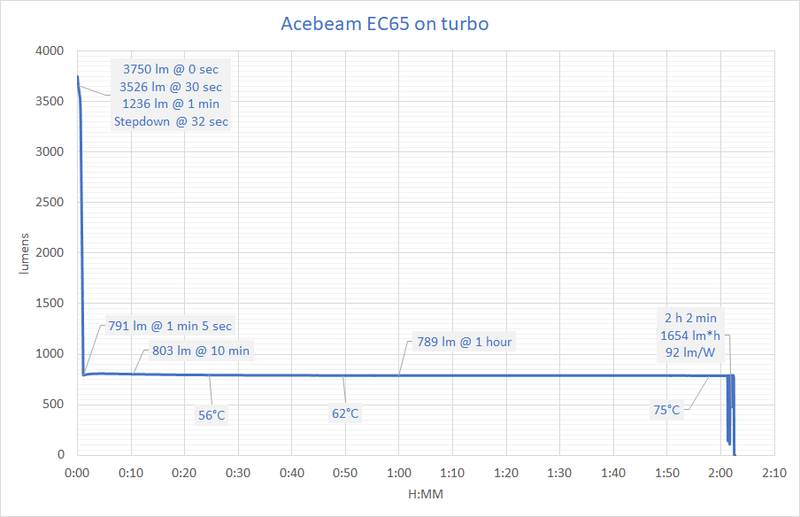 However, I couldn’t achieve a full minute of turbo like Acebeam says. Also it is not a timed stepdown or the temperature regulation that causes the first drop in output but a low battery voltage. Fan cooling doesn’t help with the stepdown. 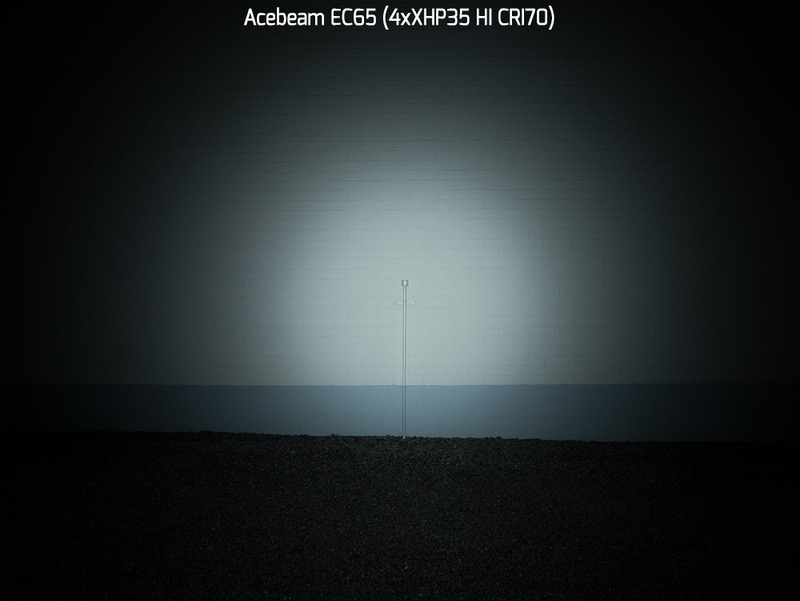 The two Acebeam 21700s behave differently from each other on turbo. 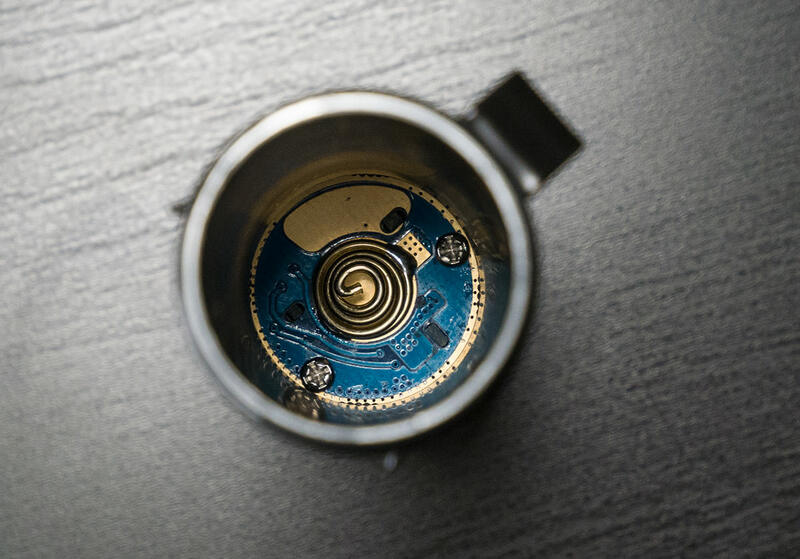 The cause is simple, the first one I received bundled with the first EC65 sample has an internal resistance of 42 mOhm while the other clocks in at 38 mOhm. This doesn’t sound like much, but it seems to be enough to make the EC65 step down at only 12 seconds on the first and at 32 seconds on the better sample. The worse one has only barely low enough internal resistance to allow for turbo to work. 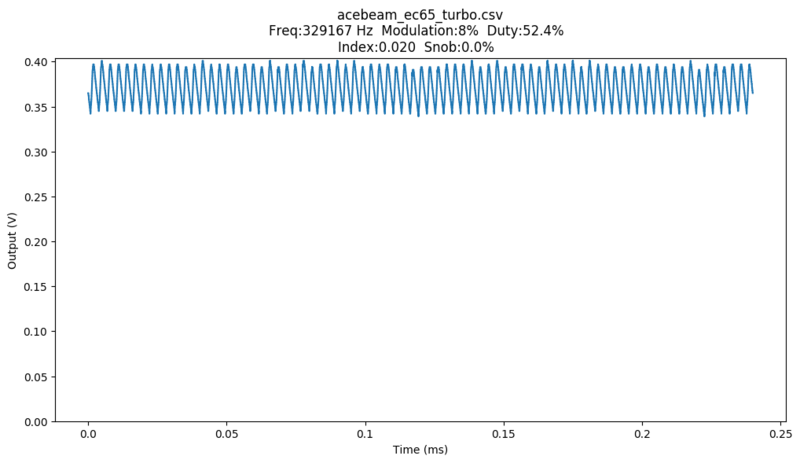 It seems that the stepdown from turbo happens when the battery voltage drops below about 3.5V. 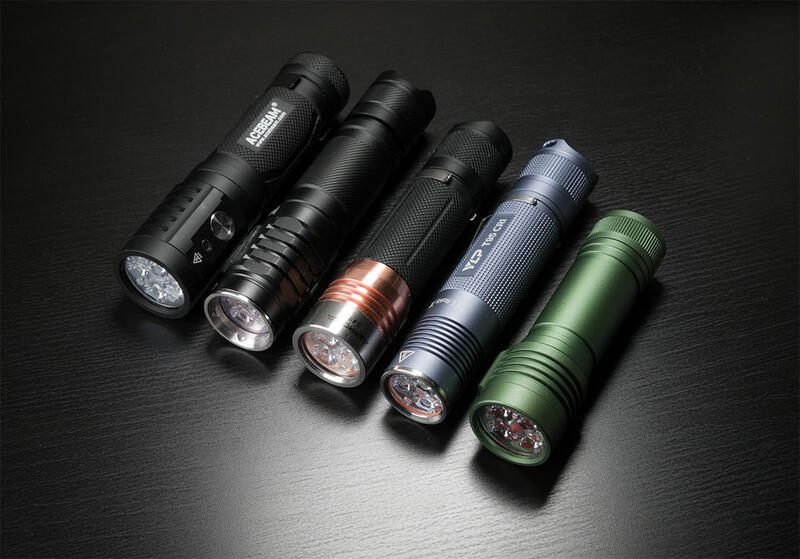 added 2018-06-15: All this also means, that you can only get the full output of 3750-3500 lumens once with a full battery. Here I did a test where I activated turbo and turned the light off when the output had stabilized after the stepdown. Then I let it cool down for five minutes with the help of a fan. After the first activation the turbo is down to 3100 lumens. 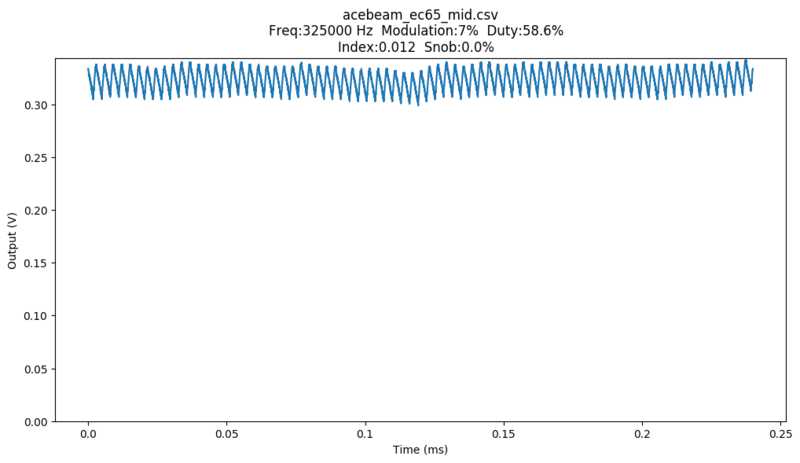 Now the Acebeam specification of 1 minute of turbo before stepdown also matches. It does produce the 3100 lumens at 0 sec and 3000 lumens at 30 sec consistently for several cycles so I’d rate this a 3000 lumen light, not 4000 and I feel Acebeam cheated a bit on this. The included 21700-18650 adapter is pretty bad in terms of resistance. 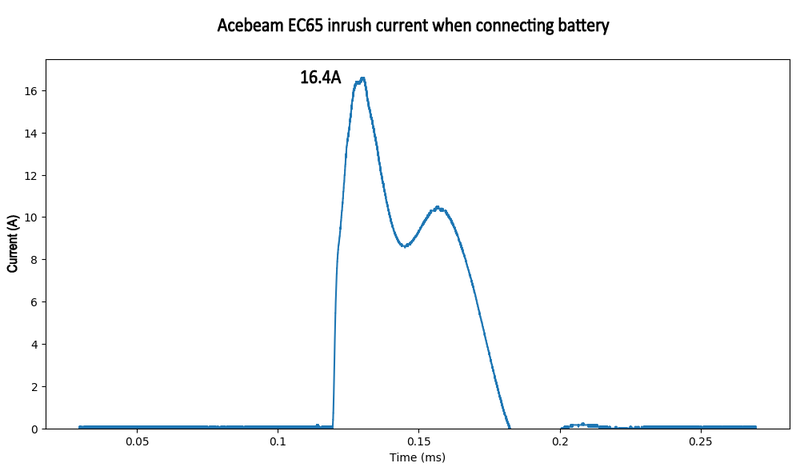 At 23 mOhm it doubles the internal resistance of a Sony VTC5A and makes the otherwise superior battery perform worse than the protected Acebeam 21700 battery in the EC65. 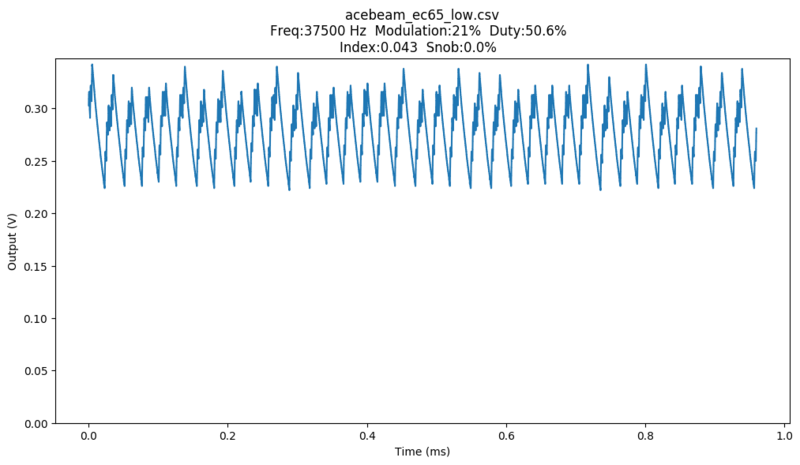 This is apparent from the faster stepdown on turbo. This means turbo will not be available with most 18650s. 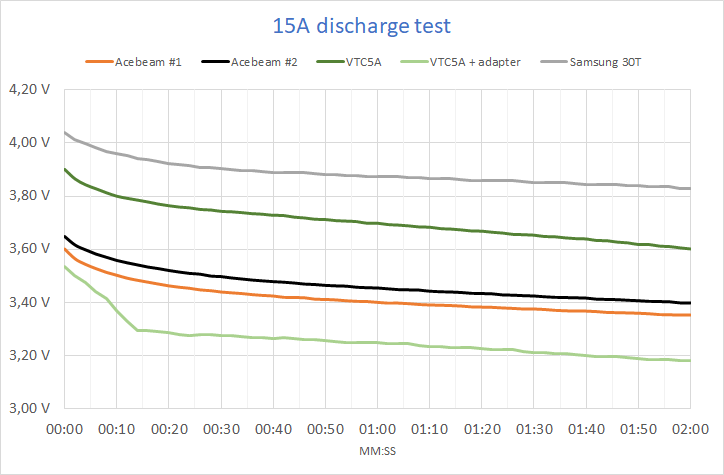 Here’s the same batteries when discharged at 15 amps (the current draw on turbo) with an electronic load. The VTC5A is clearly very good with regard to voltage drop, but the 21700 adapter makes it much worse. The Samsung 30T is on a totally different level. More tests coming when I get more 21700s to test with. 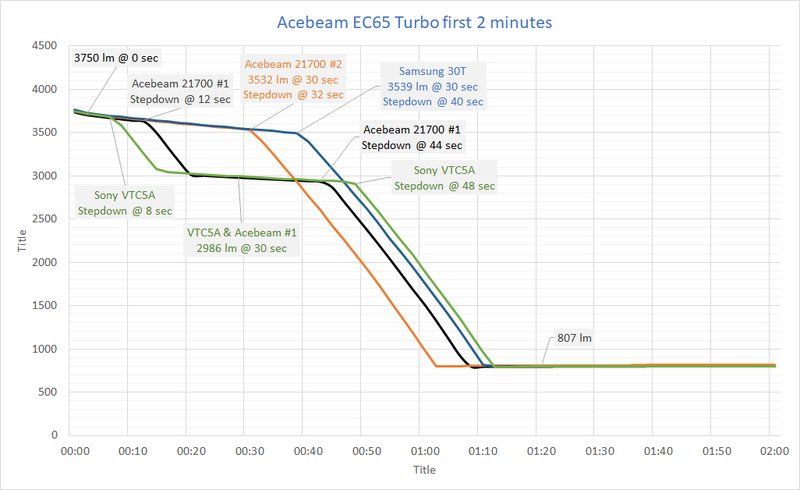 Good news, the Samsung 21700 30T not only didn’t break anything, it was able to cycle full turbo seven times before stepping down to the lower turbo level of 3150 lumens. 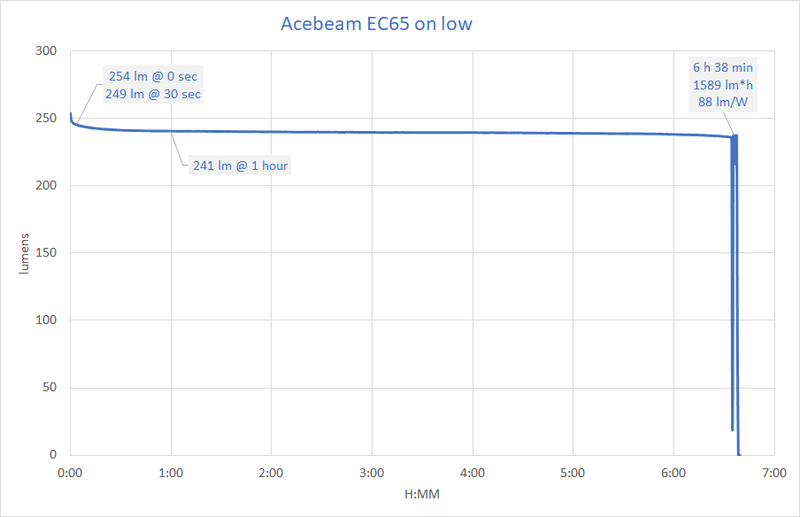 Initial turbo lasts for 40 seconds before stepping down, which is quite a lot better than on one of my original Acebeam 21700s with 12 seconds. The internal dc resistance of the 30T is only 13 mOhm. 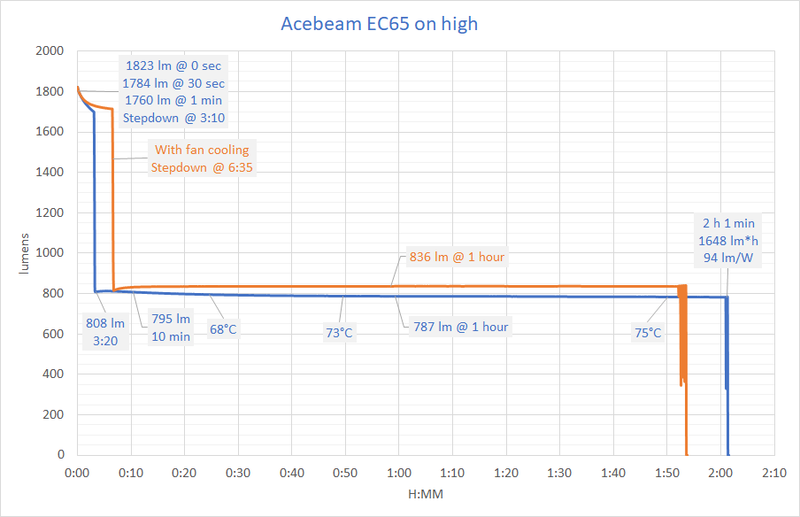 On high, fan cooling helps the output to stay higher in the beginning. On the lower modes the output is perfectly constant, but even on mid the light still gets too hot to hold after 15 minutes. The boost driver draws a lot of current from the battery on turbo. I measured 15 A with a clamp meter at turn on. 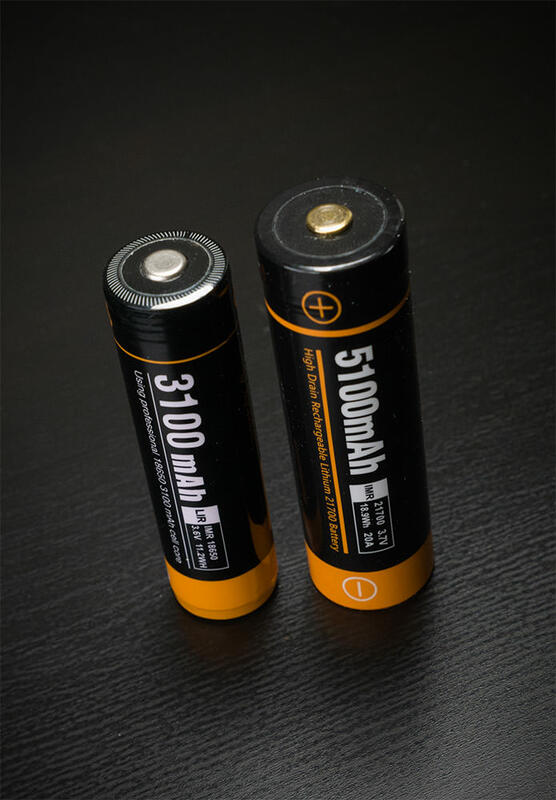 There are not a lot of protected batteries with an over current protection above 15 amps. Also, when the battery is connected as the tailcap is tightened, there’s a 15-20A inrush current. This is very short though (50µs) so it’s not likely to trip any protection circuits. I did notice sparks while measuring it with a short thick cable. There’s some parasitic drain on the batteries when the light is switched off. I recommend opening the tailcap a quarter turn to break the circuit when the light is not in use. 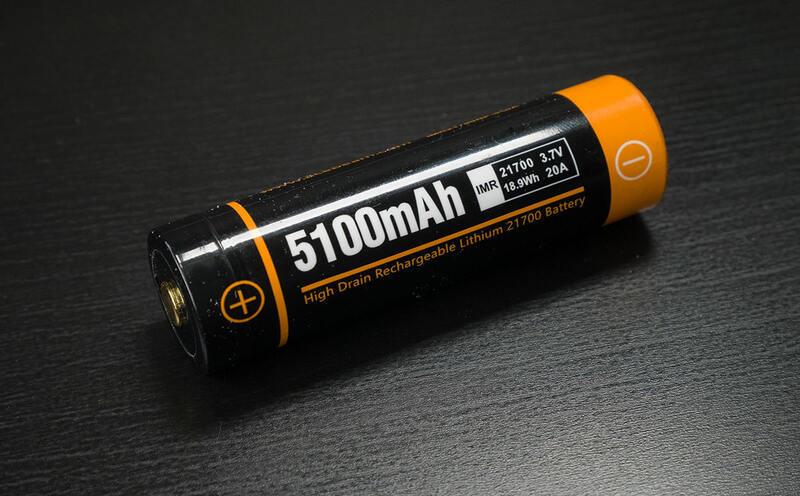 It would take about three years to drain a 5100mAh battery. When the battery voltage drops below a certain threshold the light starts to blink and finally shuts off completely. 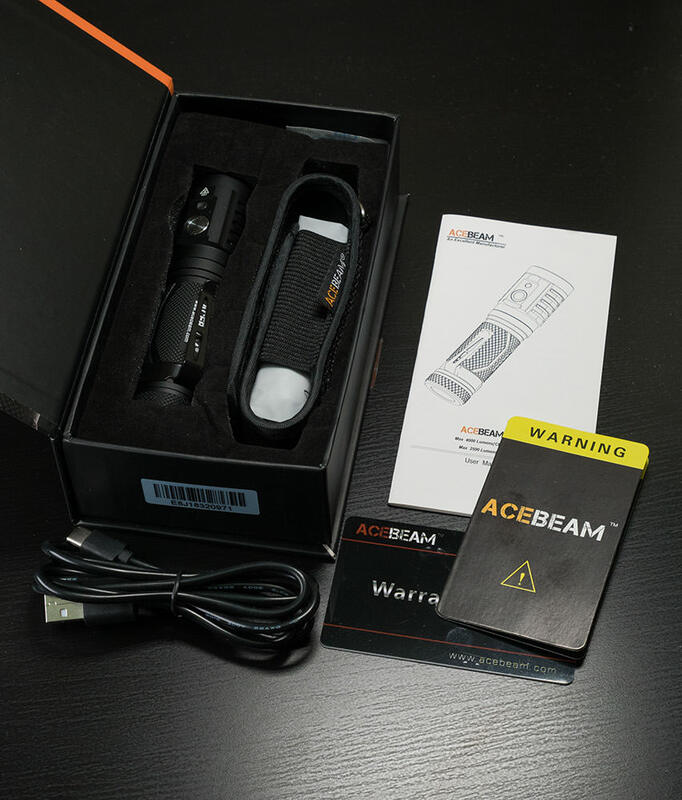 The side LED is only for charging progress, not battery voltage warning like in some other Acebeam lights. This means the light won’t damage the battery even if it’s not protected. However, since there’s some standby drain which doesn’t end at low voltages, you shouldn’t leave the battery in for prolonged periods after it has been drained. I measure the flicker optically from the LED with a Thorlabs DET36A/M photodetector and an oscilloscope. 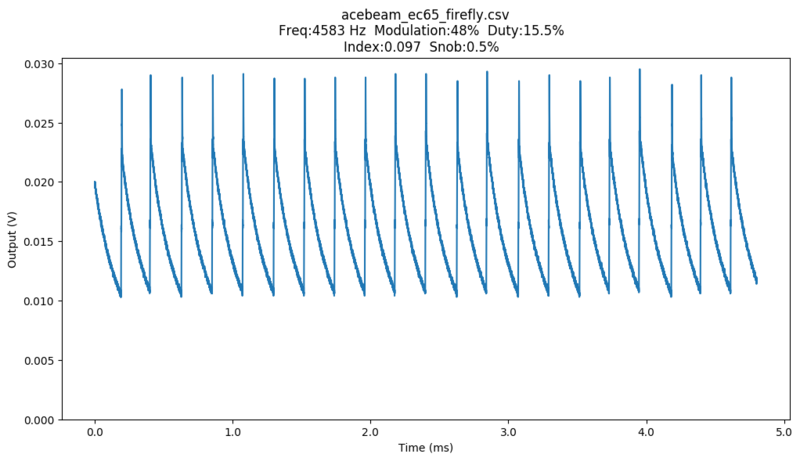 There’s some 4500 Hz ripple on firefly, but it’s not visible to the naked eye (snob index 0.5%). 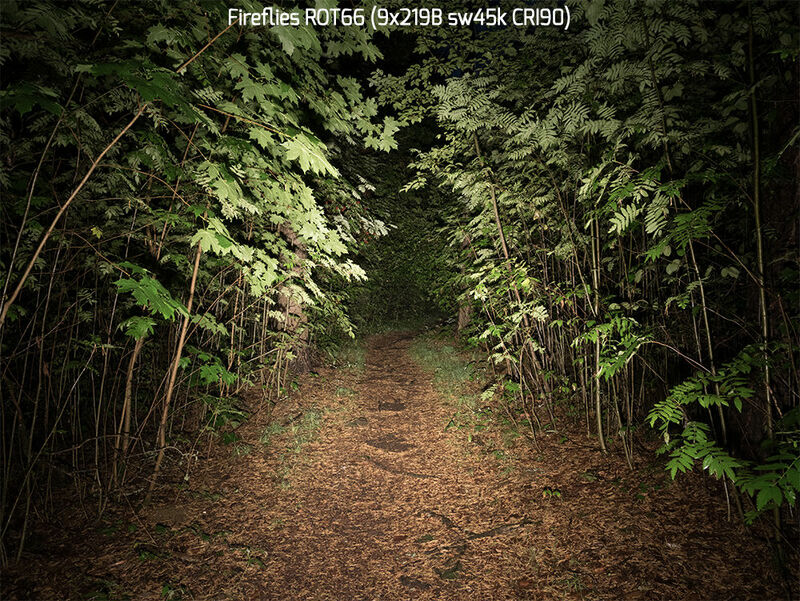 Camera phone might pick it up, but who would use a low lumen mode for photography? On higher modes the flicker snob index is 0.0% which indicates that there’s no fear of noticing it at all. 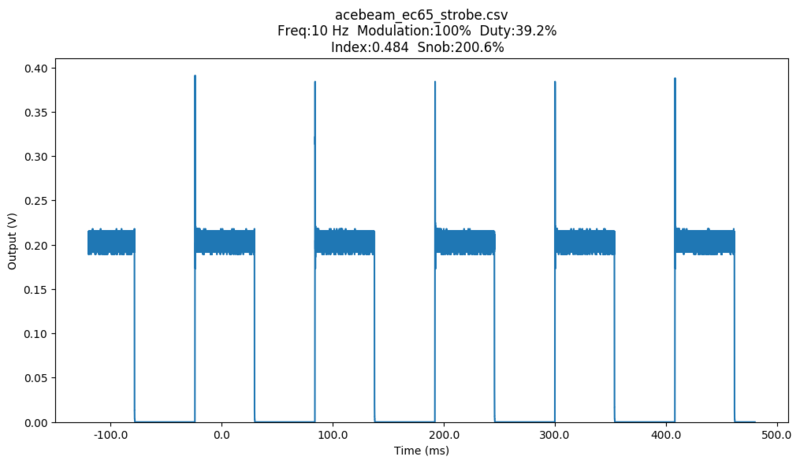 Strobe is activated with a triple click from off or on and it operates at 9.3 hertz. The output is at about the same level as high. You can hear the driver making noise while the strobe is on. 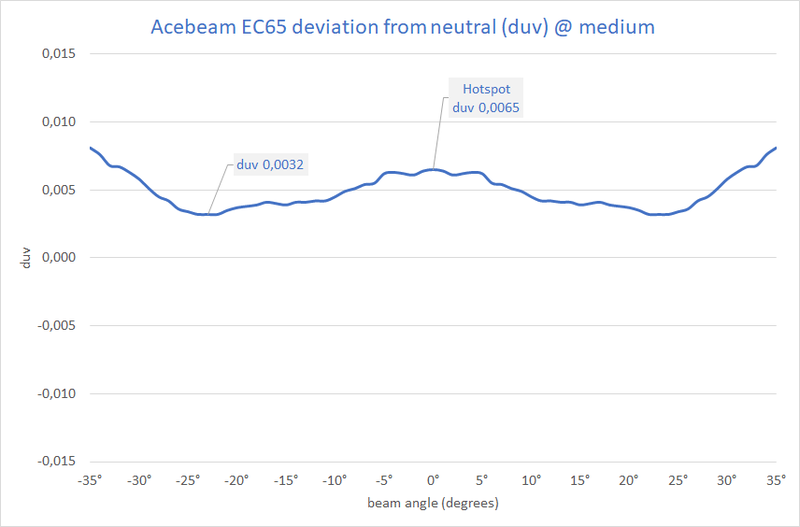 Like most Acebeams there’s thermal regulation in the EC65 to protect the emitter and driver. It isn’t very aggressive and allows the light reach skin burning 75°C on turbo and high. It is up to the user to lower the level when they start feeling uncomfortable, but it keeps the electronics safe. On turbo the level steps down even before the temperature regulation has time to kick in. 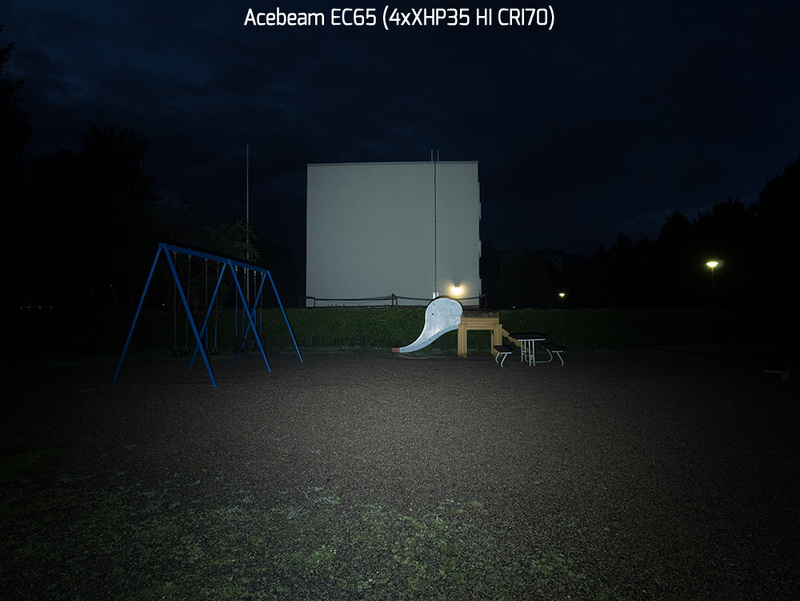 The Acebeam EC65 is a very well finished light and one of the brightest compact quads. The small size also limits its continuous output as there’s not much mass to sink the heat. Expect 30 seconds of maximum output at most. 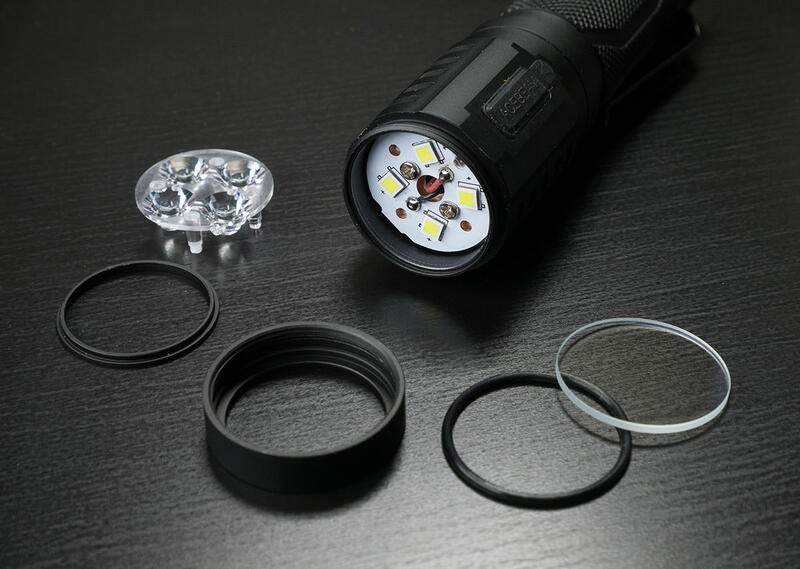 The output is close to the advertised 4000 lumens at 3500, but the measured throw of 11100 candela is far from the specified 16600 cd. On the other hand, I would have liked a real moonlight mode. 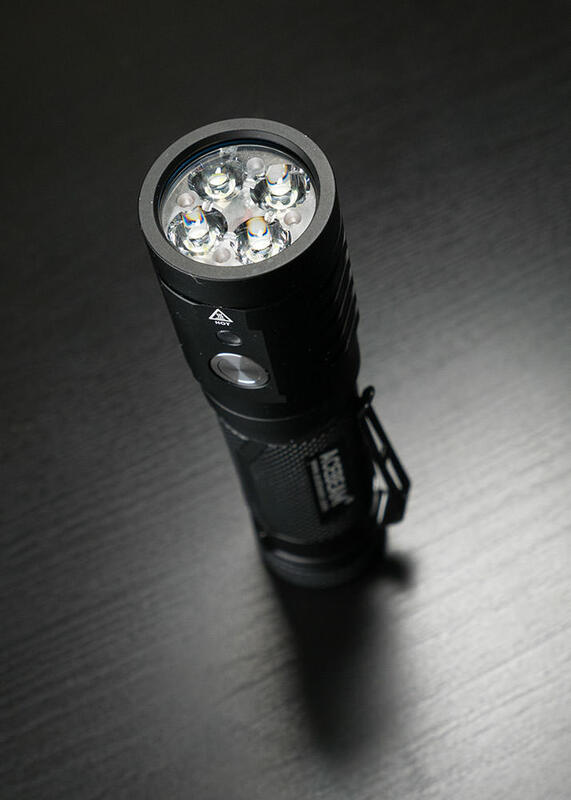 The maximum turbo output of 3750-3500 lumens is available only once with a fully charged Acebeam battery. After that the voltage drop is too large for it to reach the 3750 lumens at startup. You can pretty much consider this a 3000 lumen light after the initial burst. A better battery helps though, and a Samsung 21700 30T allow full 3750 lumen turbo to be utilized for seven times. 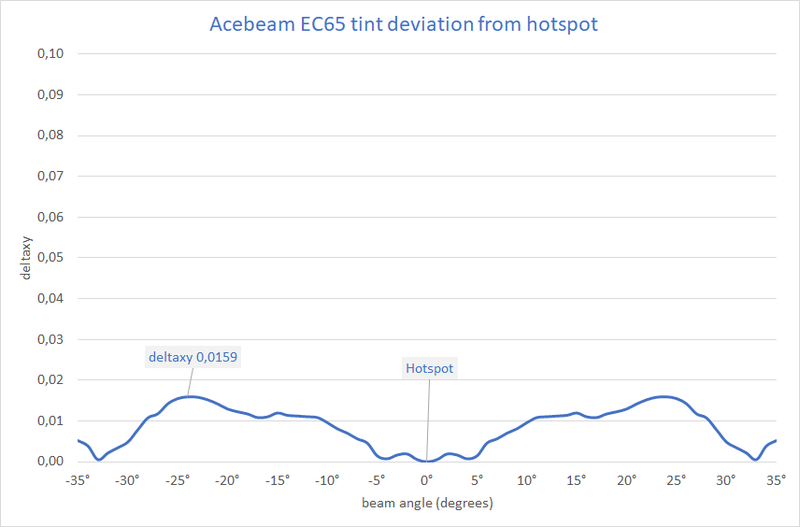 It’s no surprise that the temperature is an issue on higher modes, and Acebeam doesn’t nanny you about it. The light gets burning hot on every mode on medium and upwards. So don’t leave it unattended if a child could possibly reach it. 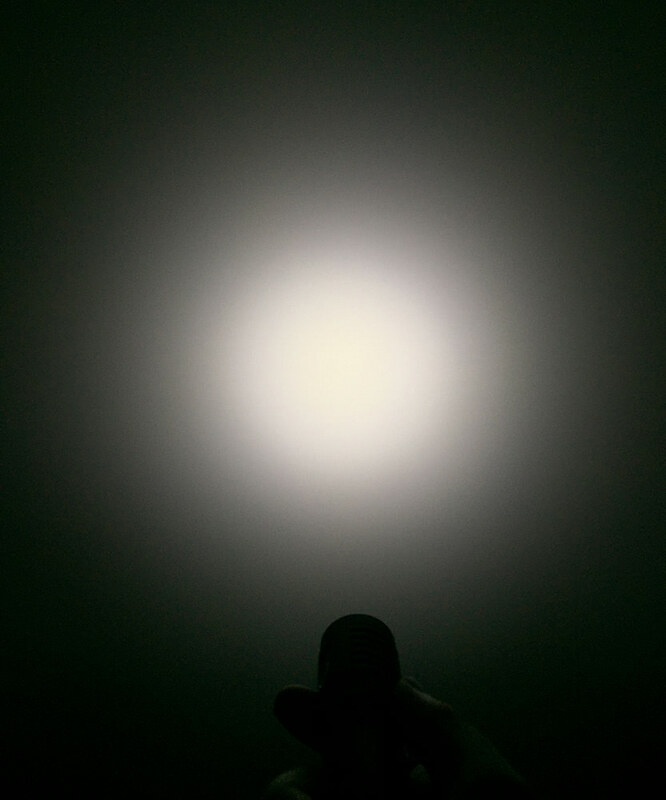 The maximum continuous output of 789 lumens is not bad for a light this size though. The output is also fully regulated. 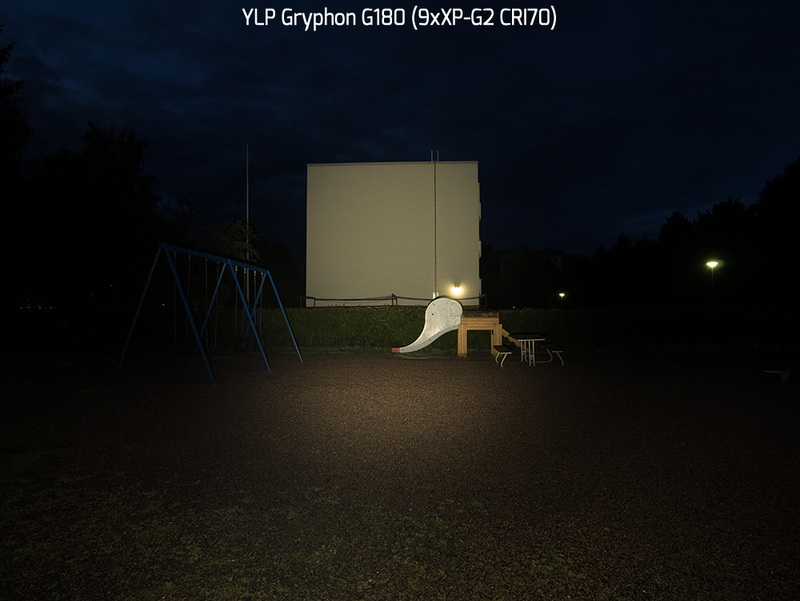 For an XHP35 HI light the efficacy is good and at 90 lm/W on higher modes a bit better than the 219C (80CRI) Emisar D4 at 50% extra runtime. Efficacy doesn’t improve on the lower modes, you get pretty much equal amount of lumen hours on each mode. The cool white beam is very even and smooth, with a slight hotspot effect thanks to the clear Carclo 10507. For friends of floodier and more even beams, it’s easy to swap the optics for a frosted one. The bezel is not glued on and comes off easily. While the measurements show that the tint is on the green side of neutral especially on the low modes, it doesn’t really look very bad thanks to the tint consistency. Only the middle of the hotspot looks a bit warmer and greener. 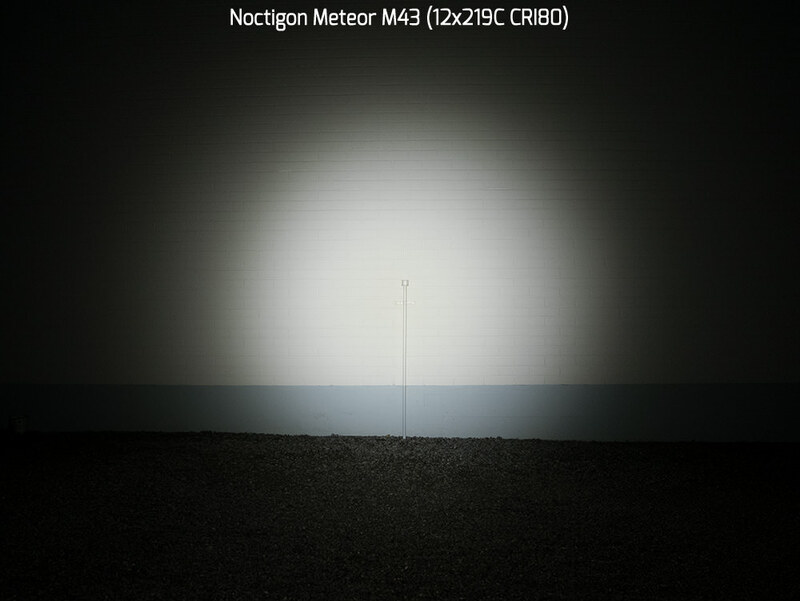 The overall tint can be of course corrected with a filter, which is easy to slip under the lens. Now this is an incredible review, everything there that I want to know! Really good. And seems to be a good light as well. This does seem like a dumb light design, though. Why use xhp35-HI at half what they can actually do, plus have to design a high powered boost driver? Why not use a different emitter, a 3v one like xp-l or xp-l2, and use a FET driver. Wouldn’t that be much cheaper to do? Maybe they are trying to avoid using a FET driver as it’s too unpredictable? Do you think the 219C version will wire them in series and use the same 12v boost driver? I don’t understand why they are using a protected cell unless it’s for liability reasons. The protection circuitry always seems to add some internal resistance which this light does not need. If they have a protection circuit that can handle 20A they should probably use it on a higher drain battery in the 4,000mah range. 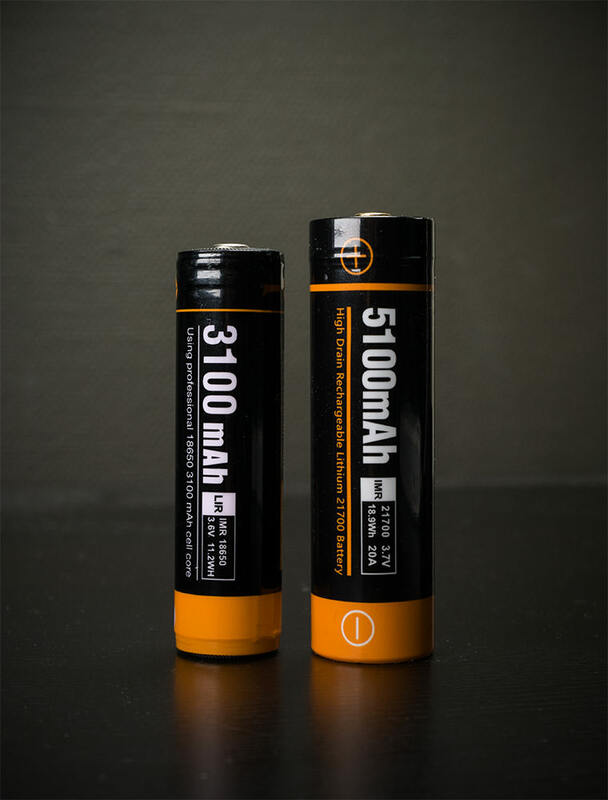 The 21700 batteries we have seen in the 4800mah to 5100mah range are not high drain. They are typically 10A continous. Maybe they chose the 5100mah to sound impressive as well as act like a bandaid to reduce the lights power thinking we won’t notice? For $140 why did they not double the springs on each end or bypass them to lessen electrical resistance and keep the voltage higher? Other manufacturers do this on lights that draw 9 and 10 amps. While this one is drawing 15A. Is the 30T one of the 21700s you’re waiting on to try in this light? I’d be curious to see how this light can handle that one. Thanks for the review! 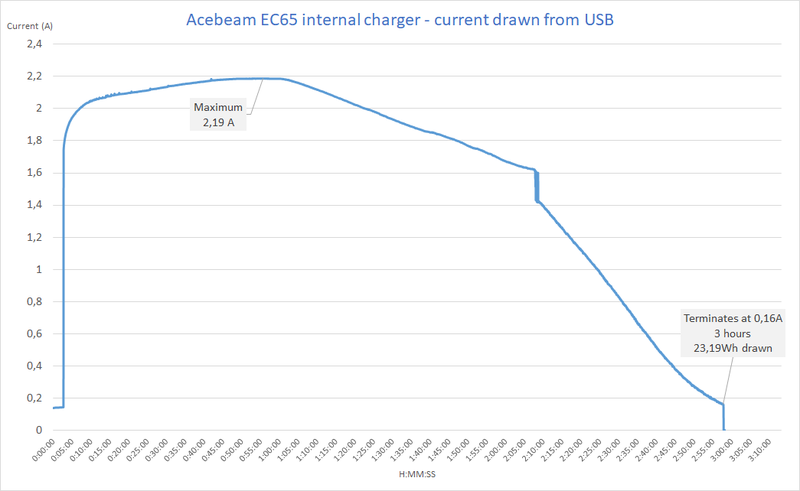 The Liitokala 4000mah already smoked one, but Acebeam said they fixed the issue. If the 30T doesn’t smoke it, it will probably allow it to run well on turbo until thermal protection steps it down. It might even allow Turbo to be used more than once! Really, the factory battery might perform much better if the springs were bypassed. An unprotected high capacity might work even better. An unprotected high drain seems best. Yeah I saw that thread. 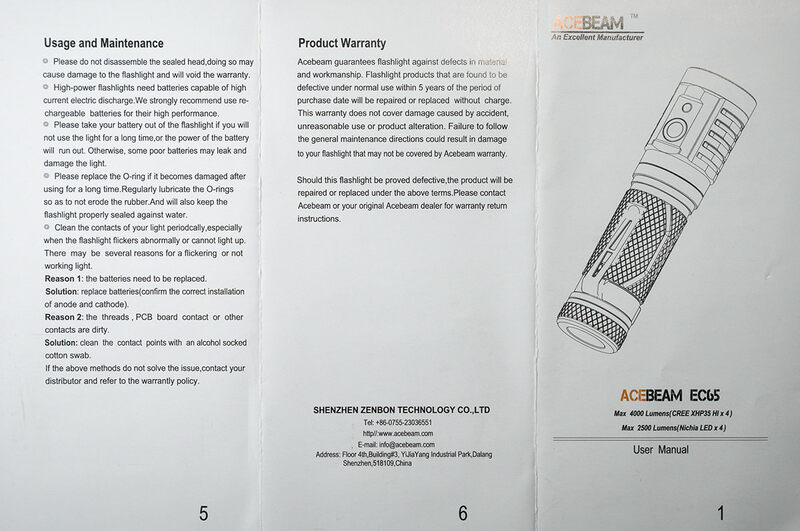 I’m curious to see if acebeam actually fixed anything at all. @JasonWW, I do wonder why they didn’t go with a 2S2P configuration with something like the XPLs, or XPL2s. That would made much easier boosting. Also, unless they want the same problems with the Nichia 219C version, I am willing to bet they are putting the 219Cs in a 2S2P array. 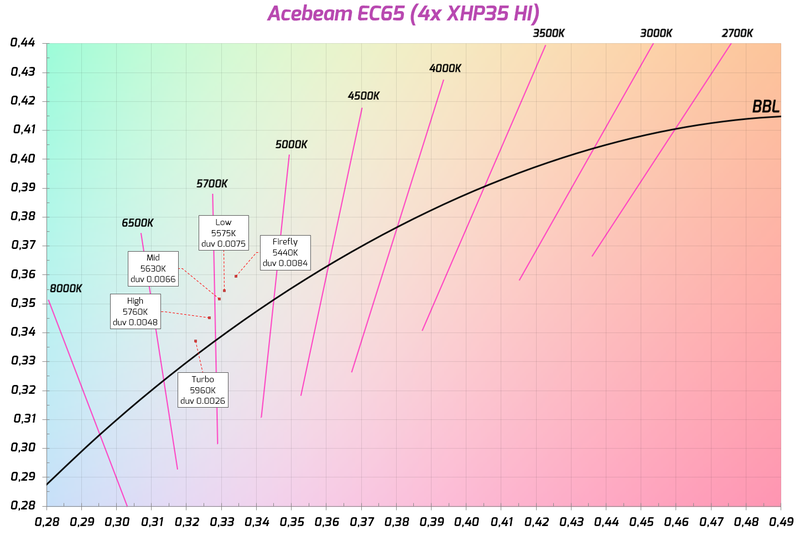 Really though, it would have been way better in terms of cost, efficiency, and brightness, to use a 2S2P setup with XPLs and Nichia 219Cs and not even get close to XHP35HIs. 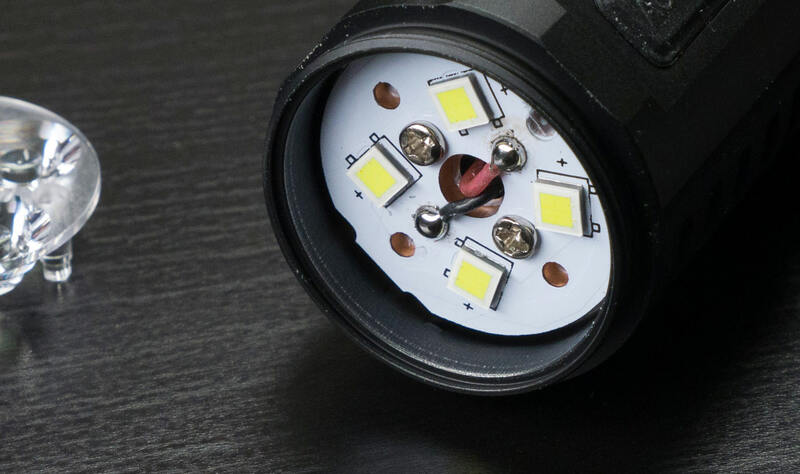 4000 lumens is easily done with these emitters and a single 21700, but only while boosting to 6V, and not to 12V, which is really hard to do as you are boosting to 4x the voltage. You have to remember that the wattage is the same regardless of the voltage. So boosting to 12v requires half the amps as boosting to 6v. I believe the higher voltage is a little bit better. 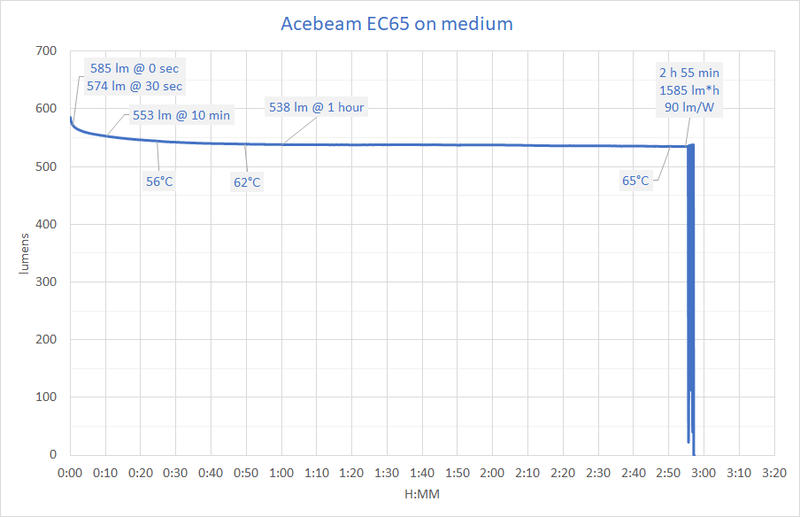 It’s less likely to burn up components or pcb traces. I will leave this detail to a driver designer. I don’t know for sure. Lexels boost drivers can do 12v 3A or 6v 6A. He may have even been able to increase these specs lately. I know they are capable of drawing 18+ amps from a battery. That is some real power. Yes, but boosting 3,6V to 6V is much easier than boosting to 12V from 3,6V, due to the lower frequency used in the boost converter and the higher voltage delta. Exactly, so what do we get for twice the price? Built in charging, regulated lower modes and a battery. 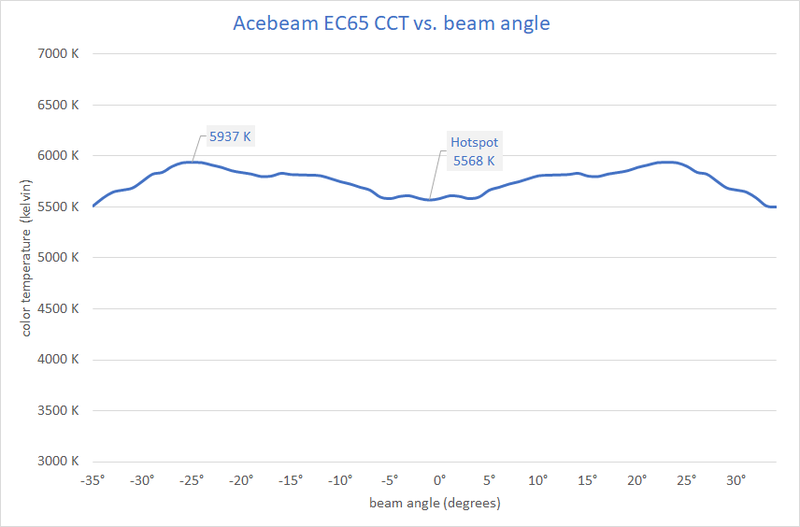 Acebeam has always been more expensive, though. They do seem to have better warranties as well. 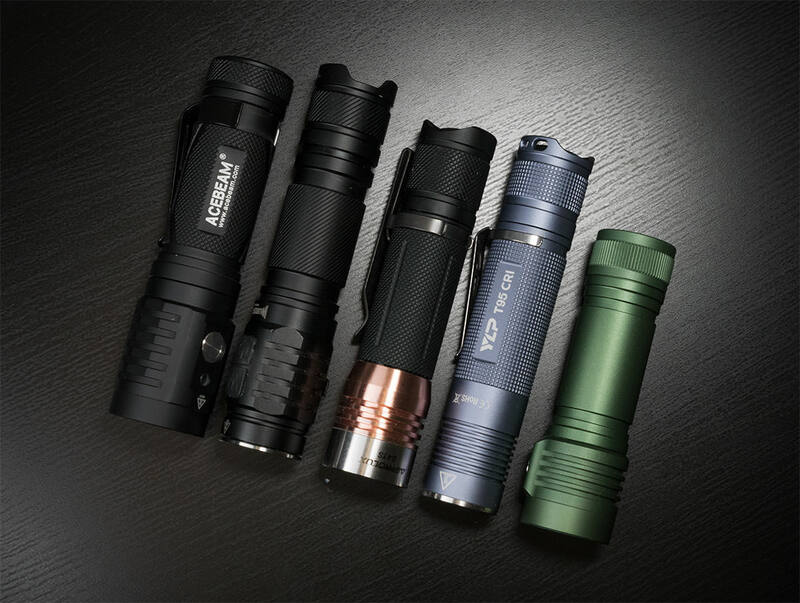 Ps, I see their Nichia version is 2500lm max. 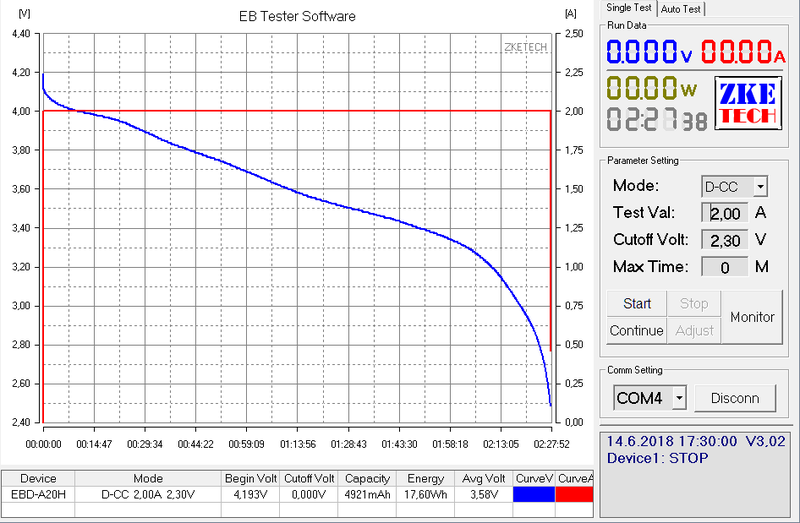 Here I did a test where I activated turbo and turned the light off when the output had stabilized after the stepdown. Then I let it cool down for five minutes with the help of a fan. 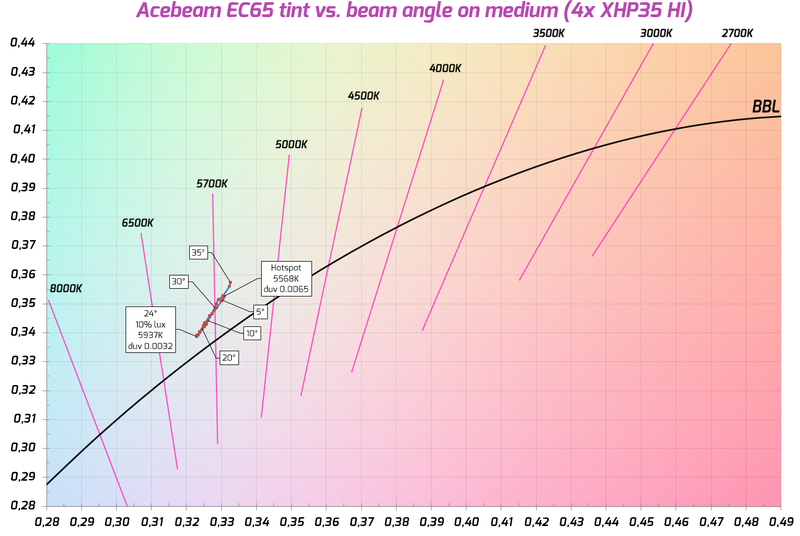 Has anyone tested the EC65 with the Acebeam ARC20700H-425A battery yet? How would this one perform in the EC65? I guess it’s the one that comes with the L30 and it has 4.250mAh of capacity. I was making the same point on toobadorz thread. 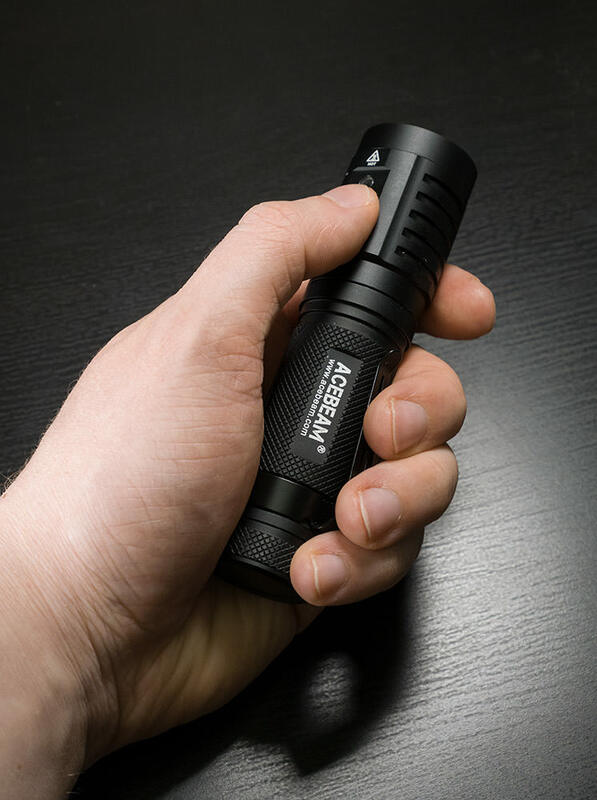 It just does not seem like it should be called a 4,000 lumen light. On the other hand, if spring bypasses were done and a better battery were used it might be able to do 4,000lm multiple times for 1 minute each time. Maybe this was their goal, but the finished product and chosen battery just has too much voltage sag. Did you see the battery tests Toobadorz posted? 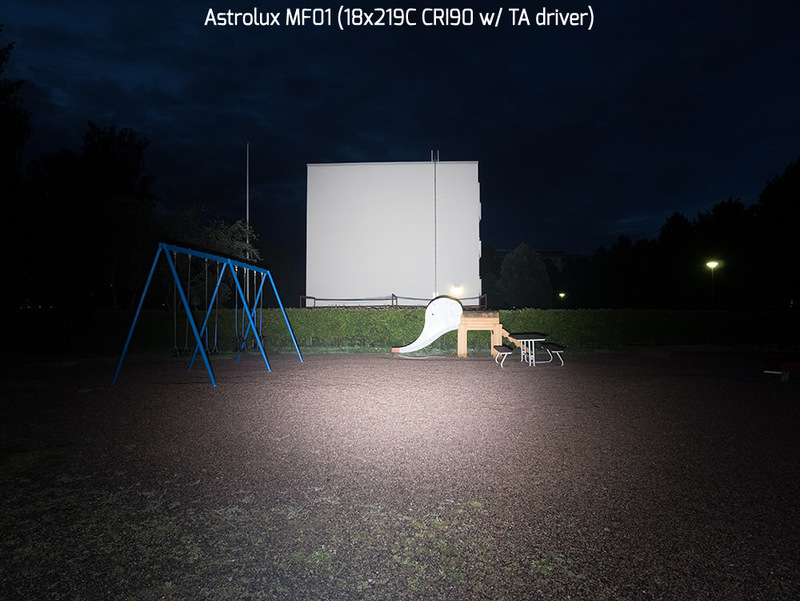 Yes I did but I could not see that he tested the ARC20700H-425A with this light. Have I overlooked something? No. It’s a new light with a new battery size. Eventually more batteries will be tested. It just takes time. 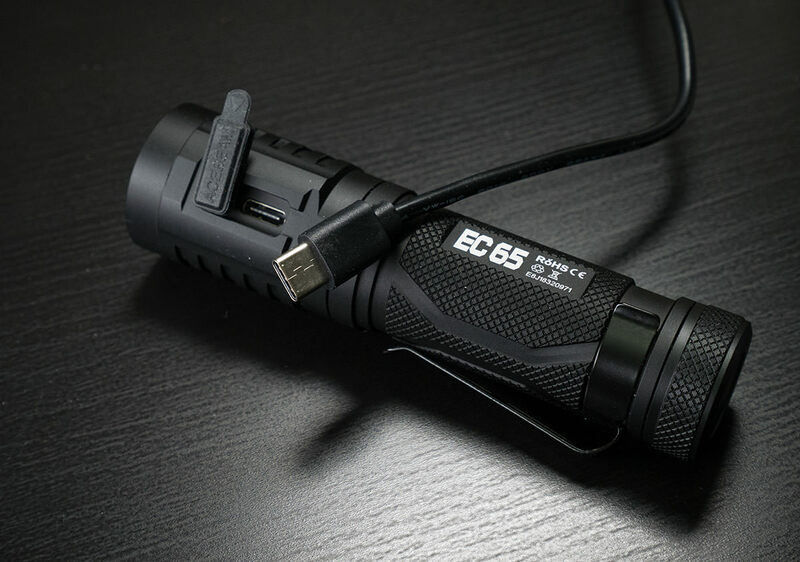 For a single battery flashlight this size, is using xhp35 with boost driver better than overdriven xp-l or othet 3v led? Just doubt about efficience and other stuff. They are all in the same ballpark. 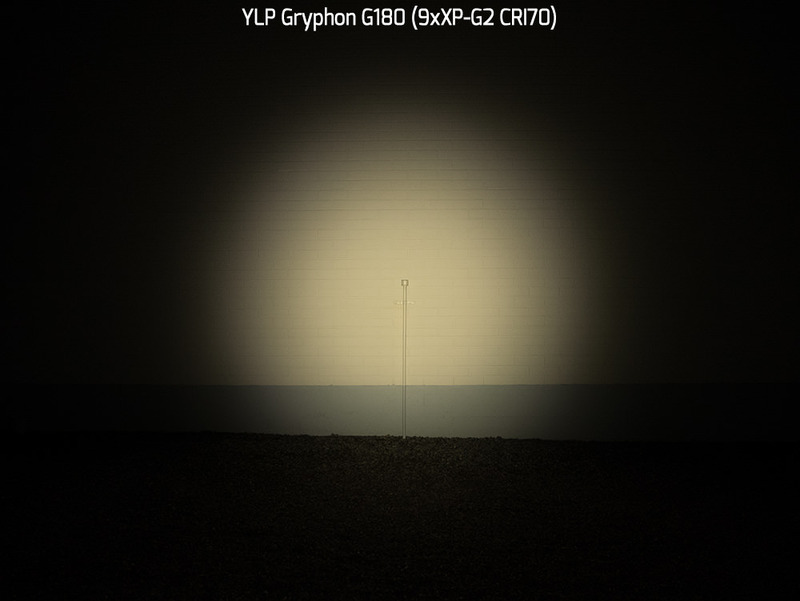 Look at the output of the xhp35-HI at 1A compared to a 3v led like the xp-l at 4A. 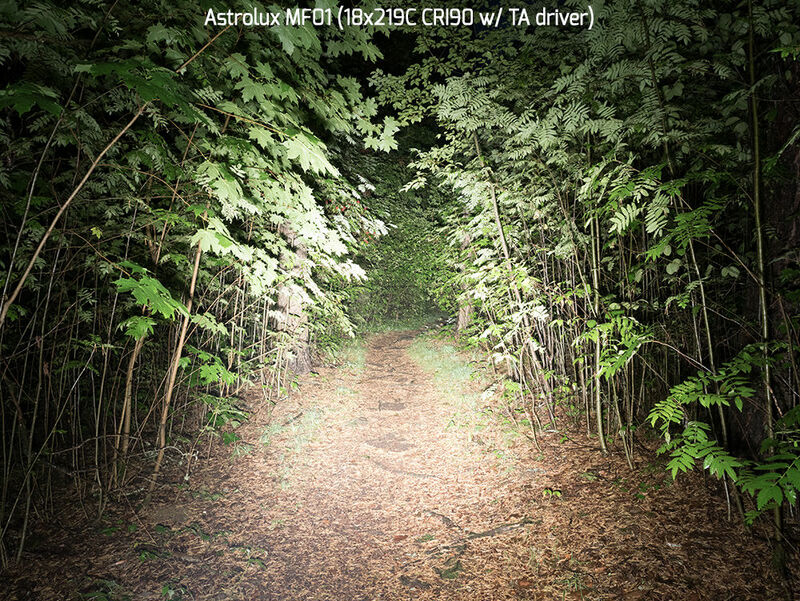 They are both about 1350 lumen (before driver and optic losses). The fact that the xhp35-HI has a bigger die than the xpl-hi (2.35 × 1.91 basically means the xpl is working a bit harder but it’s still not overly stressed. I’m guessing they used the xhp35-HI because the beam color and output looked nicer than the xpl. There may be other reasons, like it gave them a bit more output compared to the xpl for instance. A more knowledgable person than me can probably say for sure. They can try different emitters because I assume it’s using a 12v boost driver. They can make one mcpcb have 4 emitters in series (3v) and one that has 4 in parallel 12v. Someone will probably swap the 4 nichia with xpl or xpl2 down the line just to try it out. The 50.2 at the same current is 1700lm. This would turn it into a legit 5,000 lumen light with the same current and heat. The beam might look ugly, though. You could also swap in a single xhp70.2 and have a legit 5,000 lumen light. Interesting light and great review, thanks maukka. Turbo times are really good. I don’t like how they used a protected battery though, it just wastes 5 mm and increases IR. Any chance to see driver pics? You think a single instance of 15 to 30 seconds is “really good”? Do you mean it’s good for such a small light that has such high output? 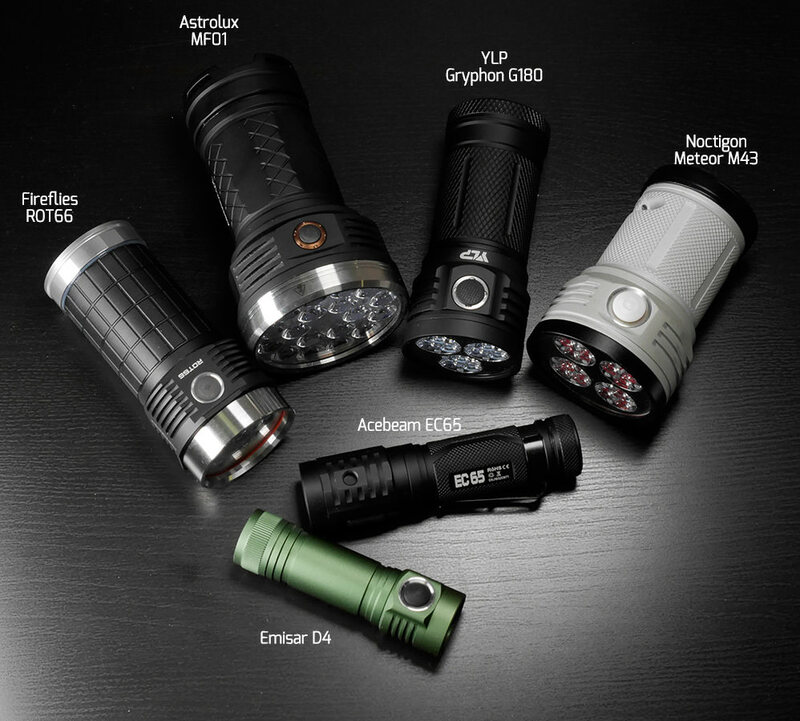 Maybe you are comparing it to the Emisar D4? Even then a single blast of 15 to 30 seconds is not that great. If they can fix the battery and voltage losses in the springs so it can repeatedly do 1 minute turbo times then I would say yes, they are good. Until then, I think they are really bad. Just my opinion. Oh! Sorry for repeating the same question. At first, didn’t read other replies asking the same thing. 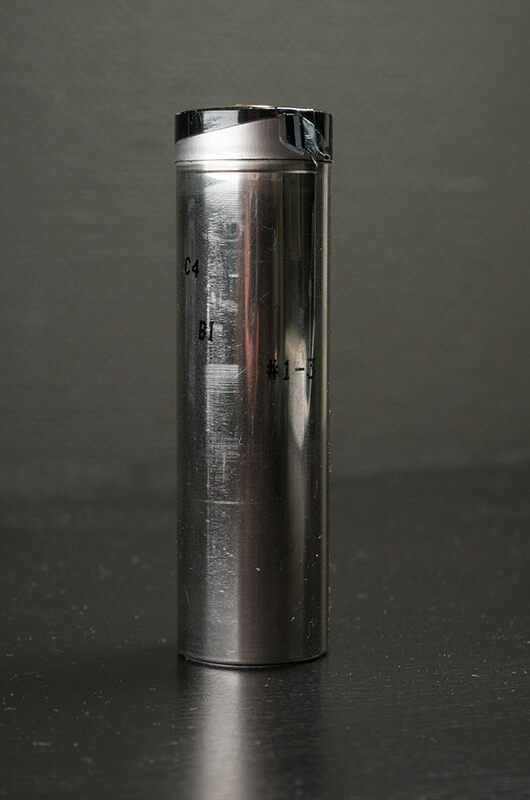 Thanks for the massive amount of data on this flashlight, that must have cost a few hours! I really like the huge data table at the beginning, 75% of all information is already there and fast and easy to absorb! 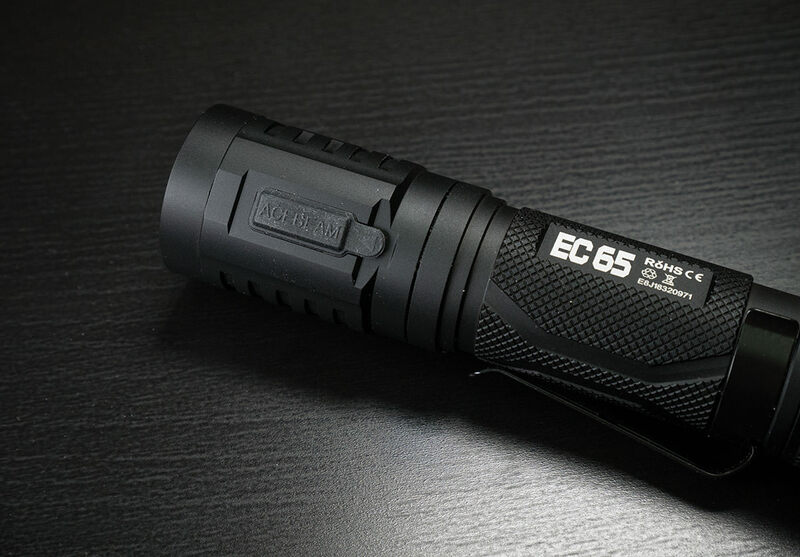 I hope that this copy of the EC65 holds up over time for you (I read the stories of dying EC65’s), it is a bit too nice flashlight too loose. There are battery problems, but the second run of 3100 lm for 1 minute seems really good to me. Do you know other lights of this size that can match that? I was talking about 4000lm turbo. You are talking about 3100lm turbo. 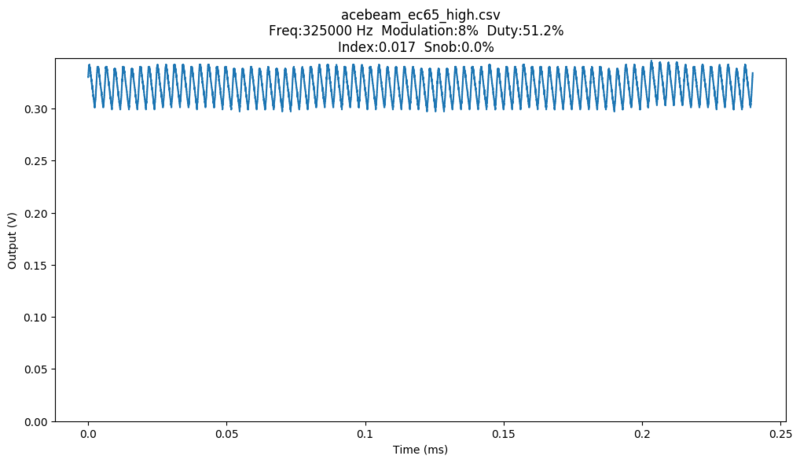 3100 lumen for 1 minute is indeed pretty good, but not what is expected. There are also not too many lights this size. period. 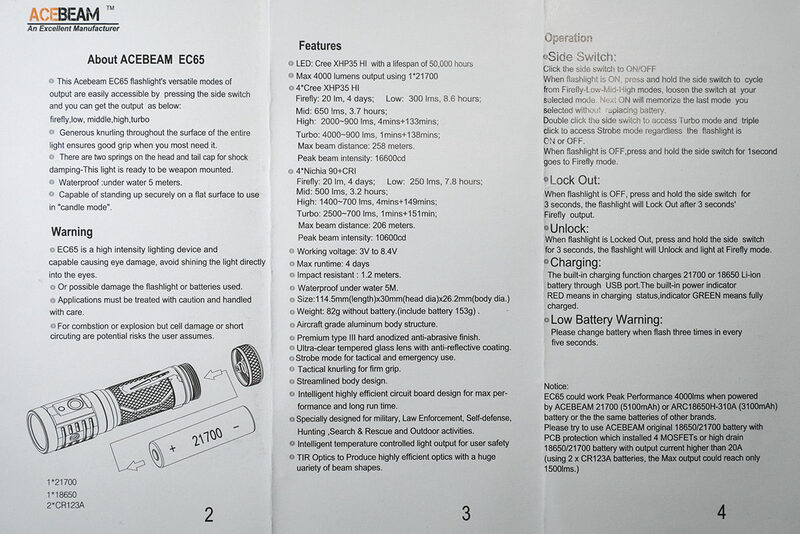 In order to get about 3100 lumen I think you would need to look at the many compact 26650 boost driven lights. They are a bit bigger and typically run turbo a bit longer. So I would say the turbo your talking about (3100lm) is quite in line with them. 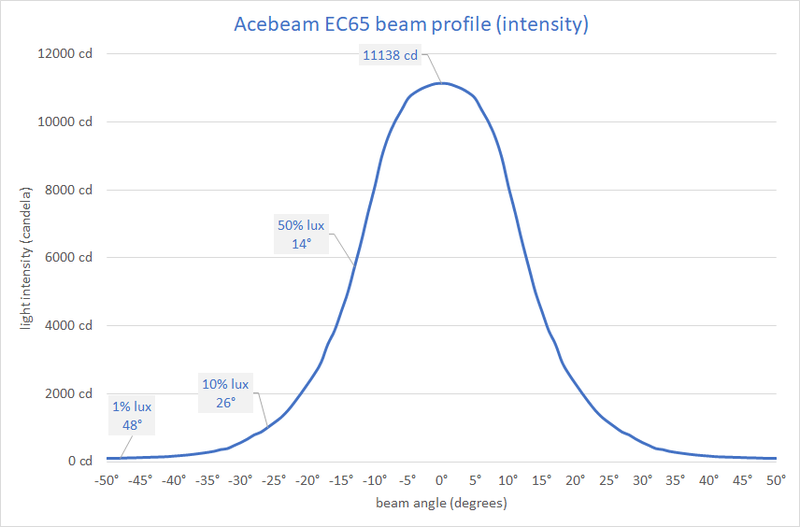 The bad part here is that Acebeam got our my expectations all jacked up, then did not deliver. If they had just spec’d it at 3100 lumen for 1m we I would not be so let down. 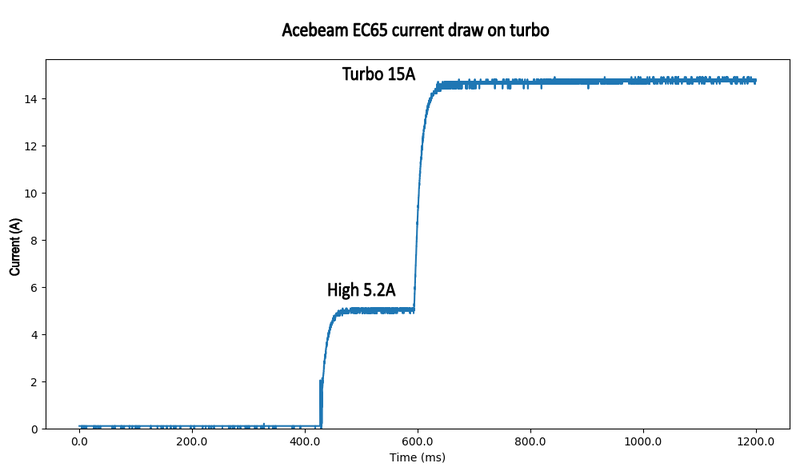 I do not feel let down, a 3000 lm flashlight with 4xXHP35 12V leds on a boost driver from one cell is new and an achievement, more so with a system efficiency of 90 lm/W at turbo. 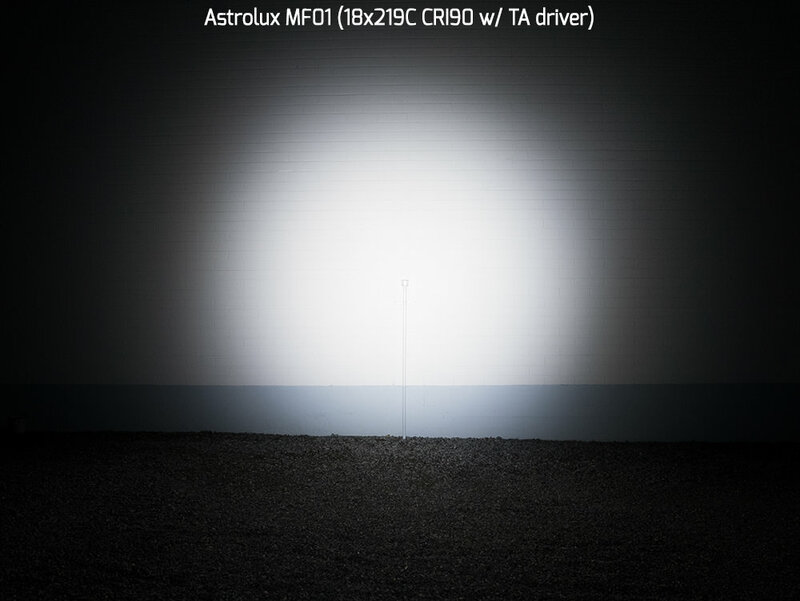 Please remember that the 90 lm/W is average over the whole turbo runtime, which is at about 800 lumens most of the time. With the turbo cycling and 1229 lm*h it comes down quite a bit. I haven’t tested the battery capacity when it’s discharged in half an hour or at ~10 A so can’t tell you the actual number, but let’s say it’s about 16 Wh which comes down to 77 lm/W. Ah, thanks! That makes it ok but not extremely special. I received mine two days ago, the XHP35 version. I do feel a bit let down, turbo for about 12 seconds. I knew from the specs the light was too lightweight. But I bought one any way thinking AceBeam could pull it off. I would rather have an extra ounce or two over the rapid loss of performance. The format of 4 tight packed LED’s over a 21700 is a winner, execution just fell a bit short. On the positive side beam is a good mix of throw/flood. As is it’s a good 2000/650/300/20 lumens pocket light. I received mine two days ago, the XHP35 version. I do feel a bit let down, turbo for about 12 seconds. I knew from the specs the light was too lightweight. 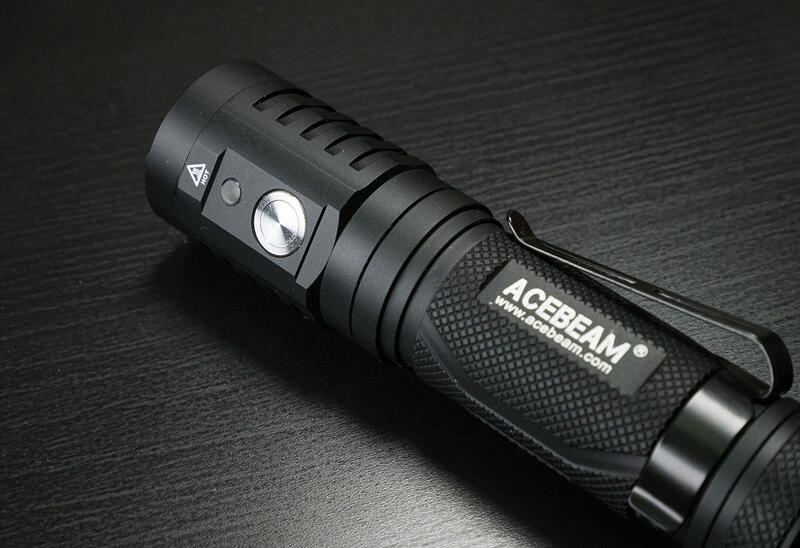 But I bought one any way thinking AceBeam could pull it off. I would rather have an extra ounce or two over the rapid loss of performance. It’s not a lack of thermal mass that’s making it drop out of turbo. If that’s what your thinking.